Directions: from Huntsville, travel on TX-19 approximately 20 miles to Trinity. In Trinity turn RIGHT on TX-94 (the 2nd traffic signal) towards Groveton. Travel 16 miles and TX-94 ends/merges with Hwy 287, turn LEFT towards Crockett. Go approximately 8 miles to Pennington and turn RIGHT on FM2781, there is a Spitfire Grill/Gas Station at the intersection. In Pennington make the RIGHT (just past the Church) and then a LEFT (just past Avery’s Welding & Feed) to stay on FM2781 towards Kennard. T bar S is then 6 miles ahead, just past Baker Springs, on the RIGHT. From Crockett or Nacogdoches, travel on TX-7 to Kennard, turn SOUTH at the flashing yellow light which is FM2781. Go approximately 6 miles and T bar S is on the LEFT. If you accidentally pass T bar S, you can continue on to either Kennard or Pennington to get turned back around. 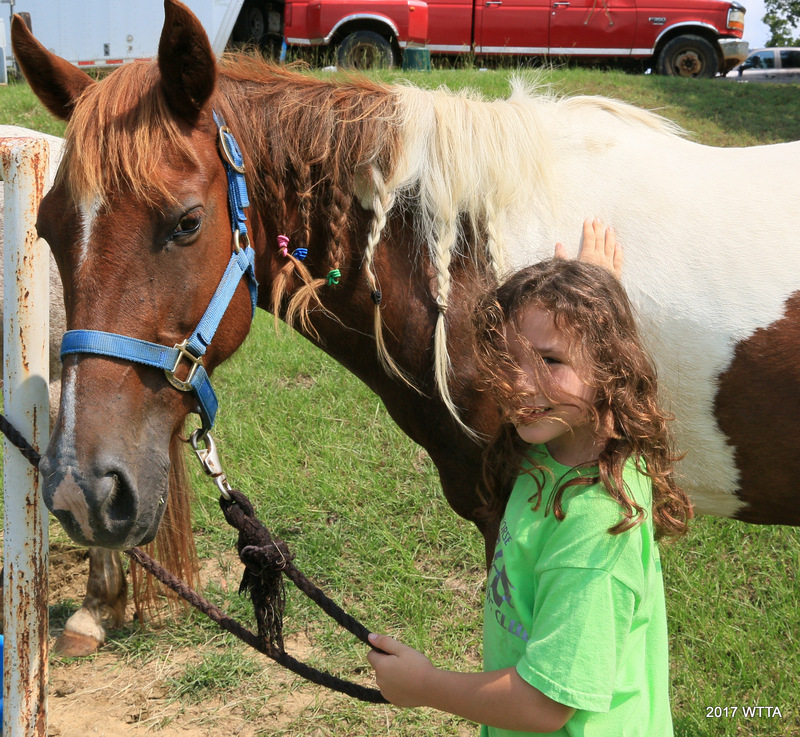 Equestrian overnight camping is allowed, with parking space available for day riders if camp is not full. 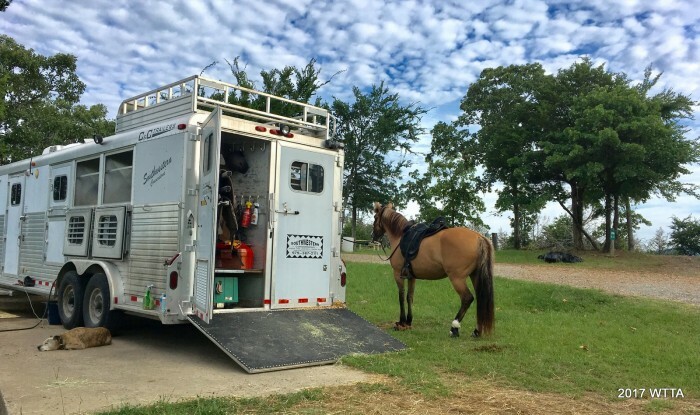 16 sites with 30 amp electric and water hookups, and 2 horse pens per site. 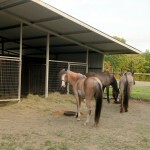 Horse pens are 12×12’, and most can be opened to 12×24 for those camping with one horse. 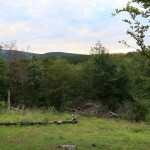 Camp for $25/night with 2 pens included in that price, reservations required. Day Riders are welcome (if space available) at $10 per trailer. 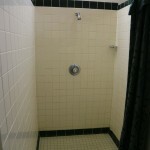 Includes secured parking and access to potable water & facilities. Contact camp in advance. 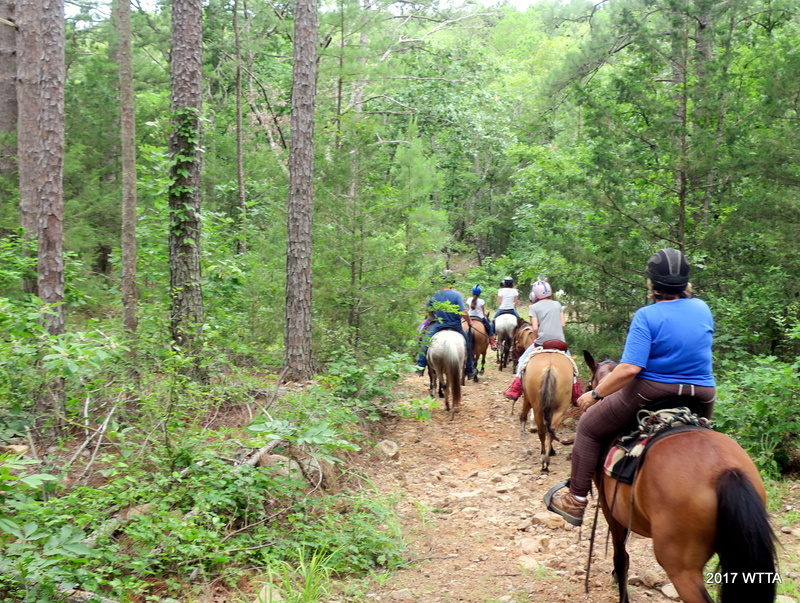 There is no fee to ride the trails. Proof of Negative Coggins Required. Check-in time is 1pm, check-out time is 12 noon. For later departure check with owners if site is reserved by anyone else. If so, can move to day rider spot or another site if want to ride before heading home. Dogs welcome but MUST be kept on a leash. It is a working farm with cats, chickens, and ducks. 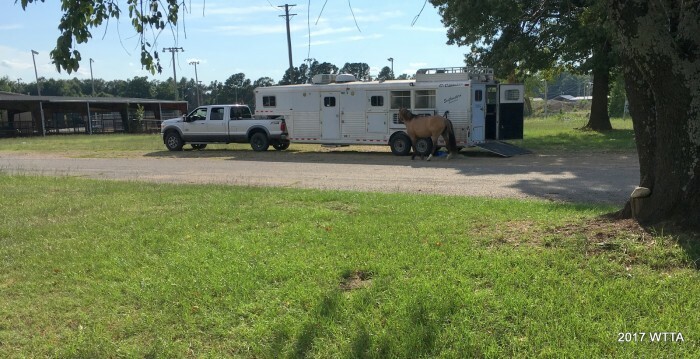 Do not tie horses to pens or trees, tie to side of trailer only please. Horse pens must be cleaned of all manure and hay upon departure. Shavings are permitted, but not provided. Campfires allowed in above-ground rings or community fire ring only. No discharging of any waste or gray water. Quiet hours begin at 10pm. Maximum 2 horses per site. 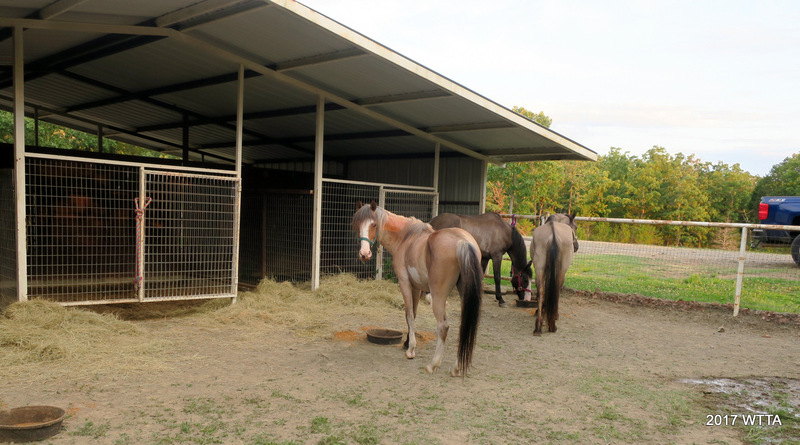 If more than 2 horses please contact owners, additional pens (if available) are $10/horse per night. 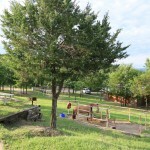 This is a brand new horse camp, which opened in 2019. 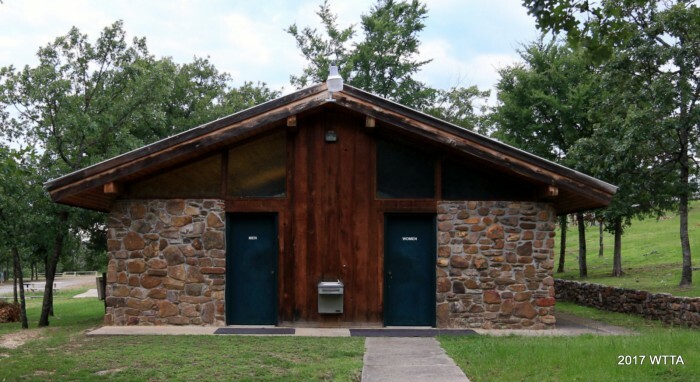 Future improvements are planned and include a pavilion with bathroom & shower facilities. 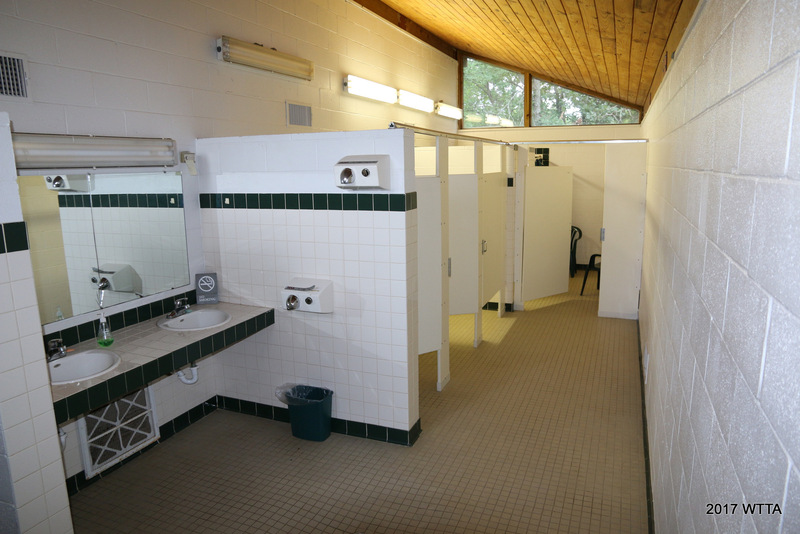 Currently there is a very clean porta-toilet for campers. A dumpster for trash is provided. 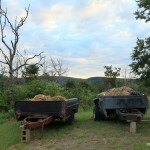 Manure is to be cleaned out of the pens and campsites and then deposited in the manure spreader, there are limited muck buckets so if camp is busy be sure to bring your own muck bucket and manure fork to make the job easier. There are two areas where multiple pens are grouped together, a water spigot and hose is supplied for those. But be sure and bring your own water hose for your campsite. 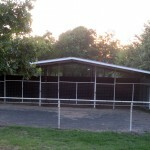 Camp and horse pens are very shady, pens that would otherwise be in full sun are covered! Some of the sites are pull-through. 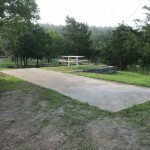 Camp is located right off a paved farm-to-market road, very easy to find and no rough dirt or gravel roads to negotiate with your trailer. Direct access to the 50+ miles of marked and mapped trails in the Davy Crockett National Forest. 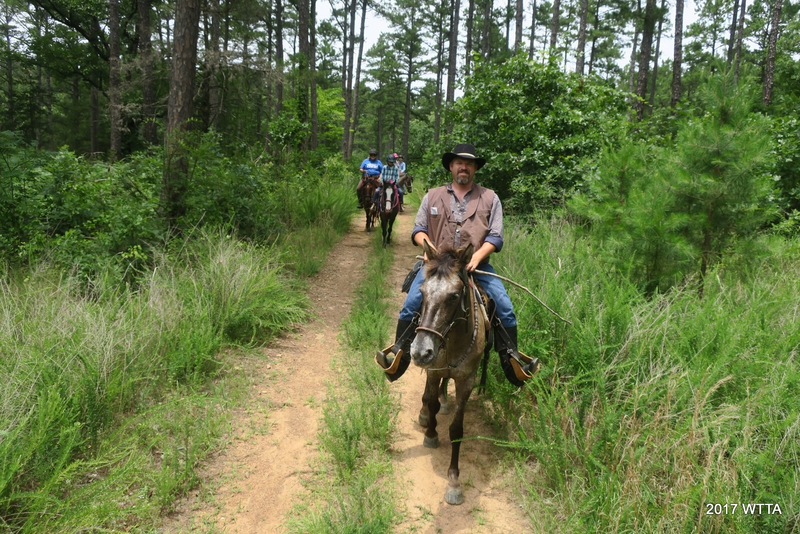 The Piney Creek Horse Trail is a system of horse trails that meanders approximately 53 miles through the East Texas piney woods in the Davy Crockett National Forest. 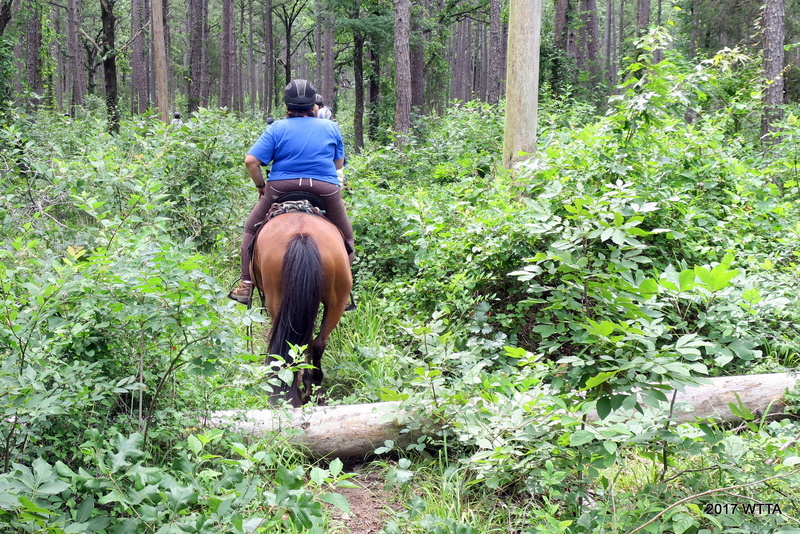 The trail is primitive; its path cleared through the forest which follows Forest Service roads, tram roads, pipeline right-of-ways, game trails, and in some places it was established by clearing brush and trees through the forest. 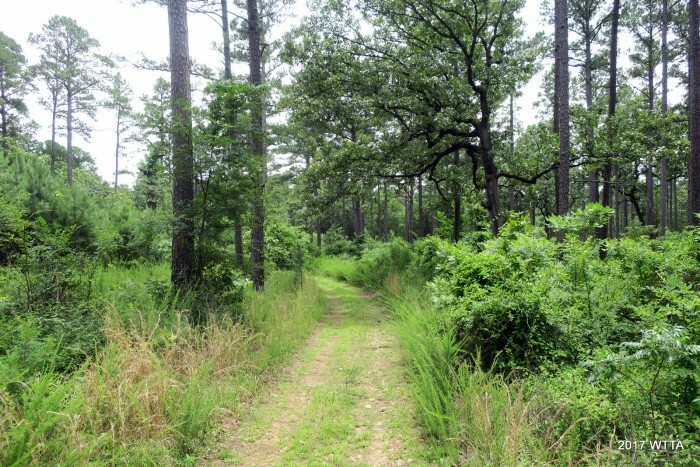 Primarily, it is on National Forest land, but there are crossings on private property and along public road right-of-ways. In general, the route is well cleared. Trails are very well marked, and all road crossings are well signed. Different colored triangular markers indicate the route. Trails are easy with gently rolling terrain. 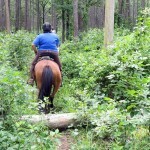 It is also very shady, making it a great place for summer riding. 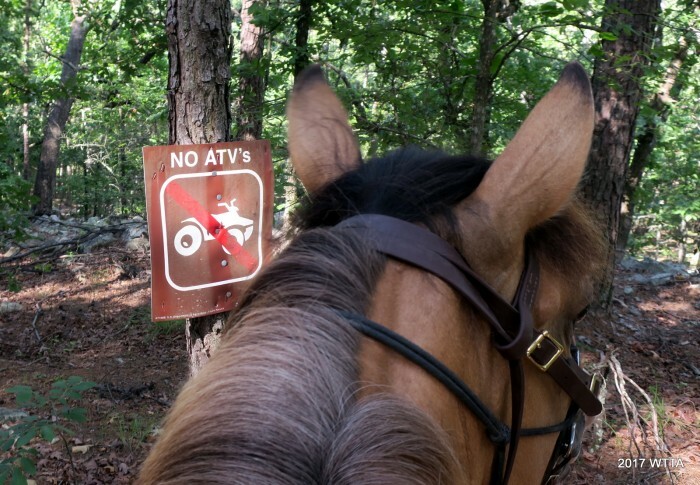 There are no motorized vehicles / atv / utv / dirt bikes allowed in the forest. 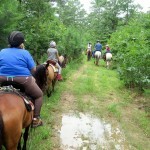 The trail is barefoot-friendly, though there may be short gravelly sections that could bother very sensitive hooves. There is hunting allowed in the forest, so it is best avoided Nov 1st through the end of gun season. The forest is commonly too wet to ride in these months anyway. AT&T and Straight-Talk cel service is very good; Sprint, Verizon etc. is very poor. 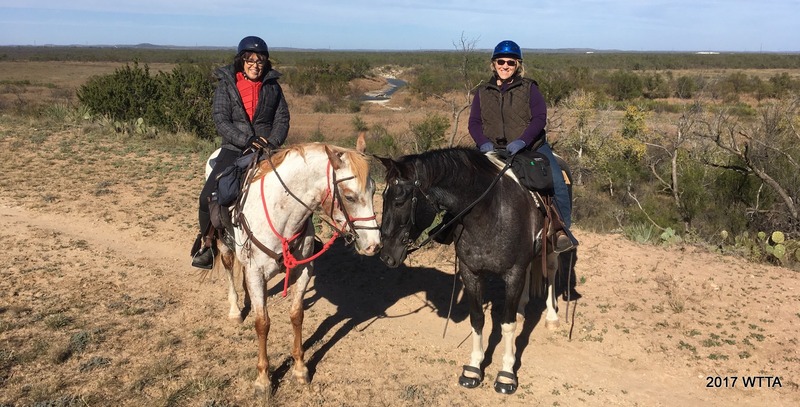 Carol Grosvenor on Bug and Caroline Moody on Jack at Cougar Lookout Trail in San Angelo State Park. 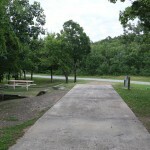 San Angelo State Park, North Shore Entrance. 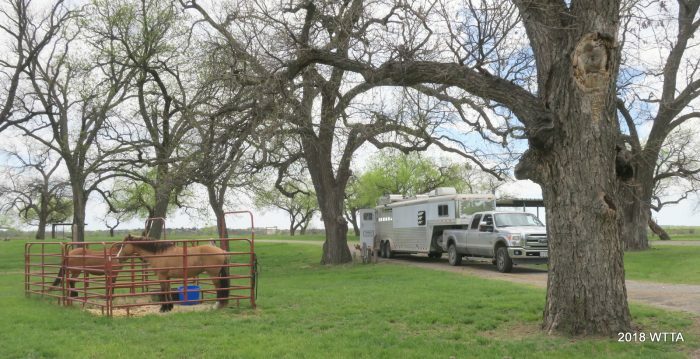 This is where you check in with your horses. Directions to North Shore Gatehouse entrance for Equestrian use: You must go through this gatehouse first to check in, pay fees, and have your Coggins checked. 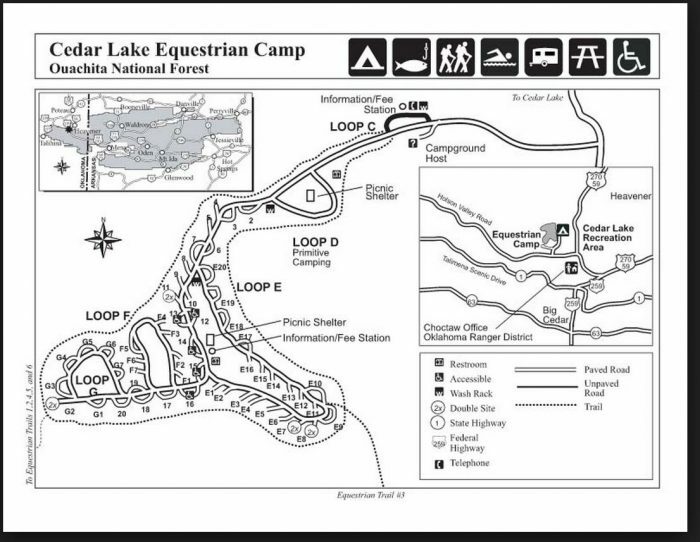 You will get a map, directions to where you are camping or the day use area, and the gate code. 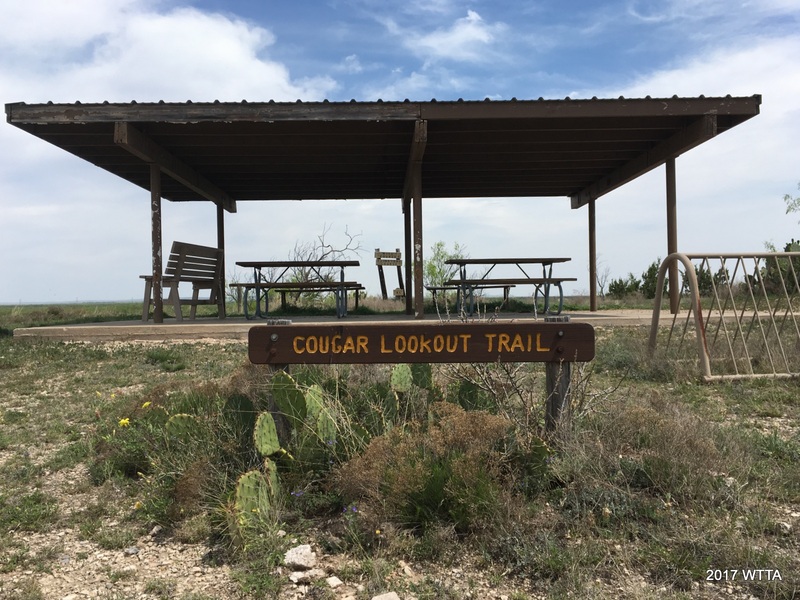 There is more than one way to get there; here is one, from US 87 turn south on FM 2288 (also known as Grape Creek Road and near the little town of Grape Creek north of San Angelo, TX). 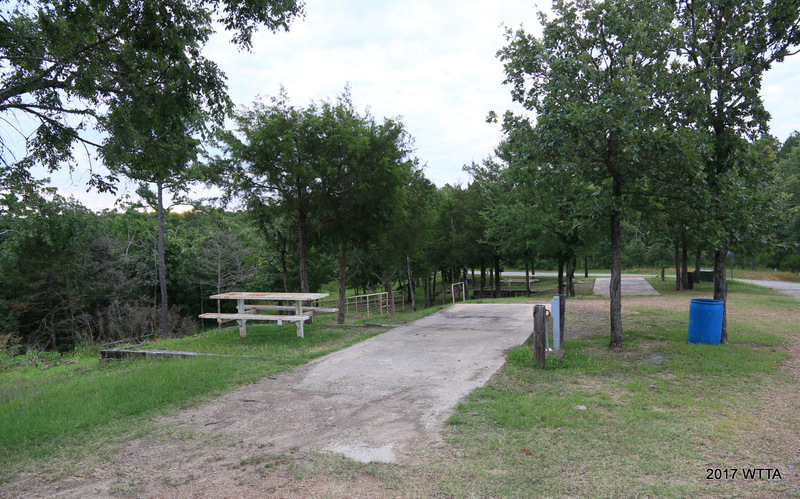 Just before the bridge crossing / river, turn left (see park signs) to the San Angelo State Park North Shore Gatehouse entrance. There is enough room to get your rig turned around easily once you get checked in. Day Use – First, check in at the North Shore Gatehouse (pay fees, have Coggins check, get the gate code, and be sure to get a map). Turn around and head back out of the gate entrance, go left on FM 2288, cross the river, and take the first left. 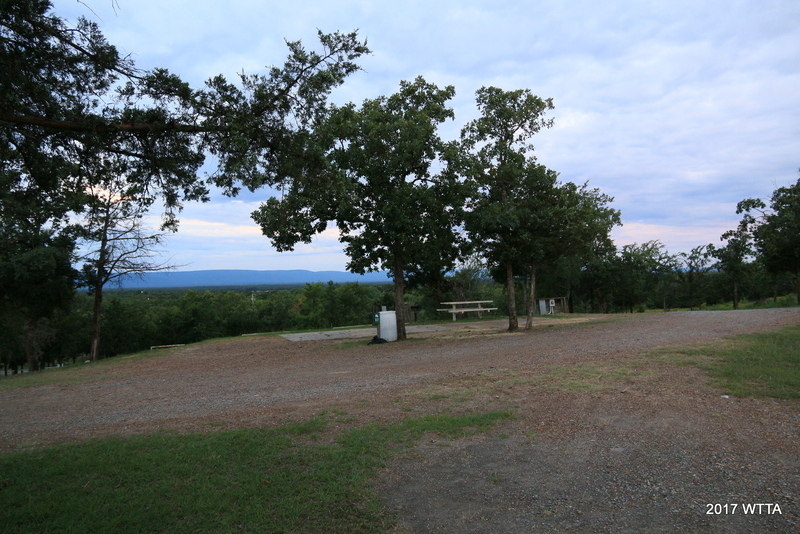 Pass the North Concho Camping area and continue to the end of the road where there is a large parking lot area. This area is basically a concrete parking lot. 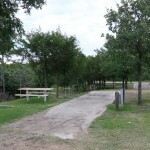 At the backside of the parking lot is the main trail access entrance called, Bells’s Trailhead (point #7 on the maps) with a brick metal archway, posted map, hitching rail, and two benches (which can be used as mounting blocks). From here continue straight for a beautifully shaded stroll next to the river on Shady Trail or go right through the gate to get to the main trailhead to trailhead route and/or Dinosaur Trail. 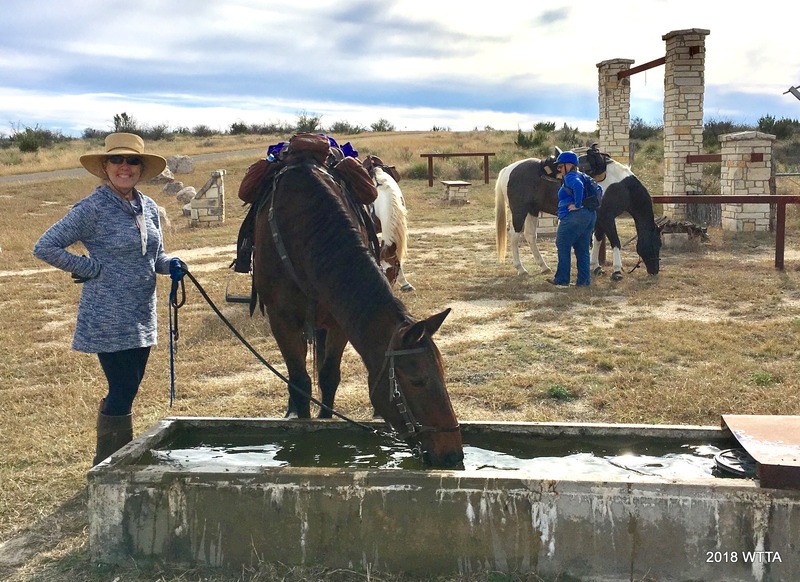 North Concho Camping Area – is the main equestrian camping area. First check in at the North Shore Gatehouse (pay fees, have Coggins check, get the gate code, and be sure to get a map). Turn around and head back out of the gate entrance, go left on FM 2288, cross the river, and take the first left (gated entrance ). 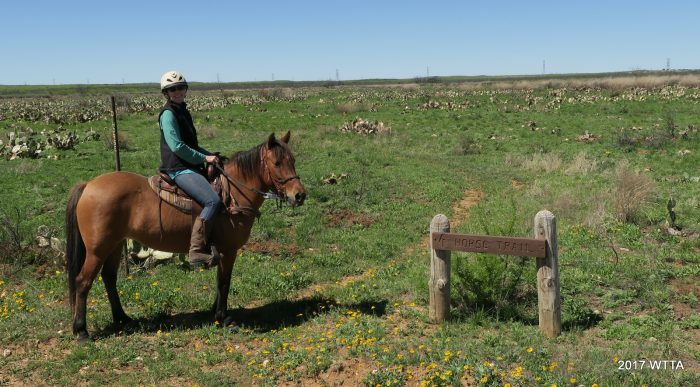 When riding to the trails you can just cross over the main park road and go through the gate or you can follow the park road south to Bell’s Trailhead (point #7 on the maps). 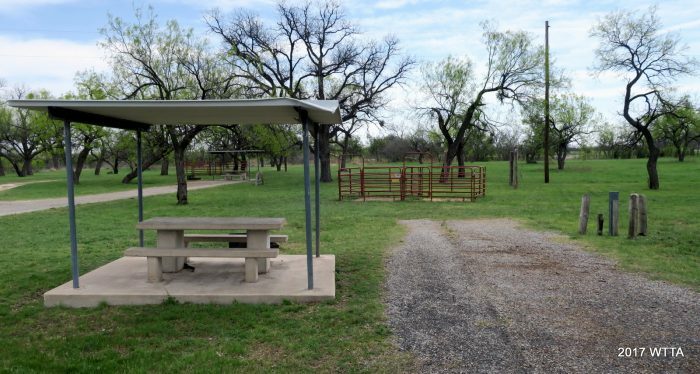 At North Concho, there are 23 well maintained camp sites, all are primitive except for sites 1-10. Sites 1-10 have water, electric, a covered picnic table, grill, two metal paneled horse pens that share a center panel and are about 10 by 10, three tethering posts to high tie your horses, a level asphalt parking pad, and large oak trees. Some of the sites are pull through. There are no mounting blocks. 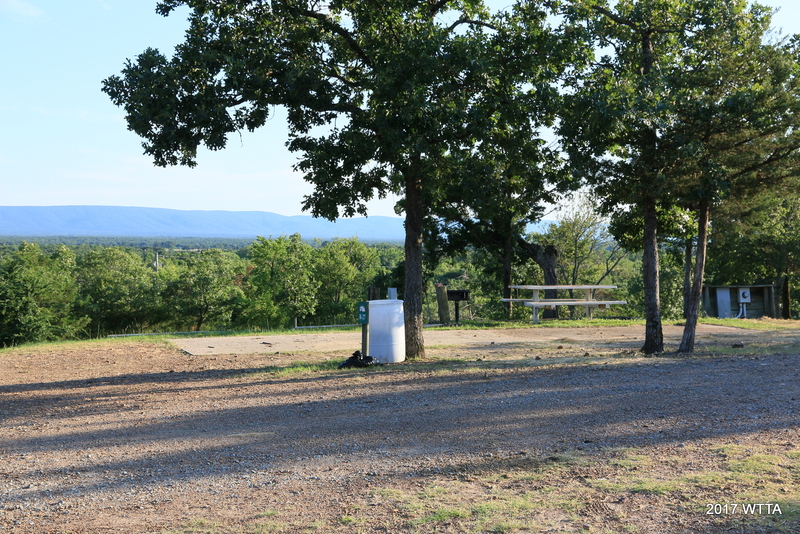 The campsites are beautiful and well kept. On my visit in March we had no issues with the electric hookups but in November of 2017 they were working on some of the electric hooks ups and was able to get mine going just in time. However, my microwave did end up shorting out and I was not sure if that was due to it’s age or problems with the electricity. 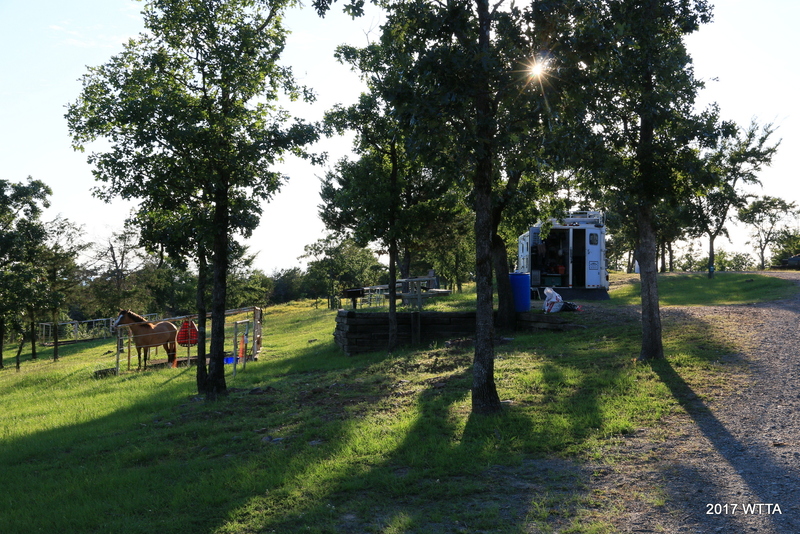 There is lots of shade and grass on the campsites and you can set up your own pens (to include electric) if you want your horse to have more space and grazing time. Park hosts told us we could spread our manure in the field. 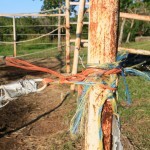 I loved the extra option of the tethering posts and used them to high tie my horses to give them a break from the small stalls while I cleaned the stalls, or tied them to tack up. 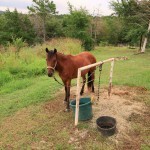 I also high tied my younger mare using the tethering posts when I rode off on her buddy and left her behind. This was the safest way to contain her, as she most likely would have reared up on the stall panels and possibly caught a hoof in between the panels. She does not like being left behind. The stall would not have been safe for her while in a state of emotional abandonment. My husband stayed behind and kept a close watch on her as well. 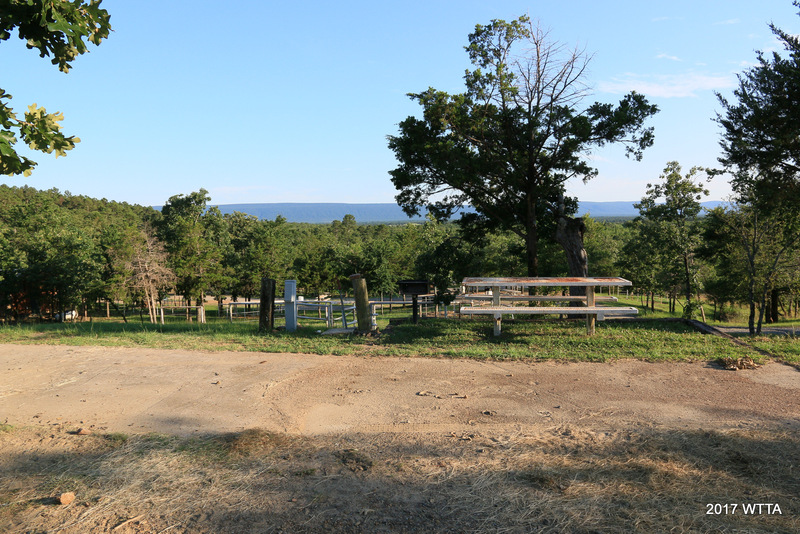 The primitive sites vary with some (not all) having one larger paneled horse pen and/or three tethering posts, covered picnic tables, grill and/or fire ring, and some had paved parking pads while others are only dirt. There are no mounting blocks. There is an enclosed men’s/women’s restroom (chemical toilets) but no showers. There are showers in the Bald Eagle Camping Area which is located by way of the North Shore Gatehouse entrance. Firewood: is provided and located by the restroom area; donations are encouraged. A dumpster for trash is also located near the restroom area. 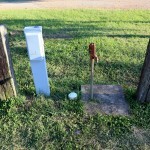 An RV dump station is located on the way out of the North Concho Camping Area. Bald Eagle Camping Area – This area has water/electric sites as well as primitive sites. 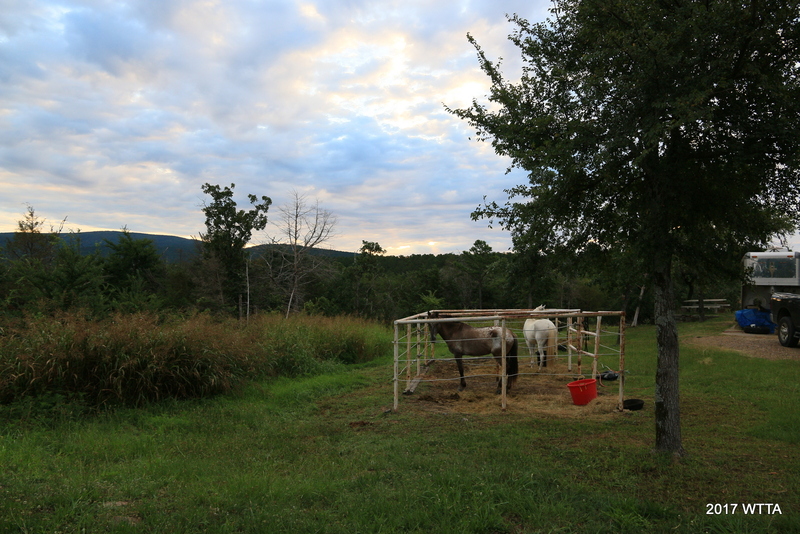 Horses are sometimes allowed here, with permission from park staff, but there are no pens or tying posts. You are allowed to bring your own portable pens to the park. 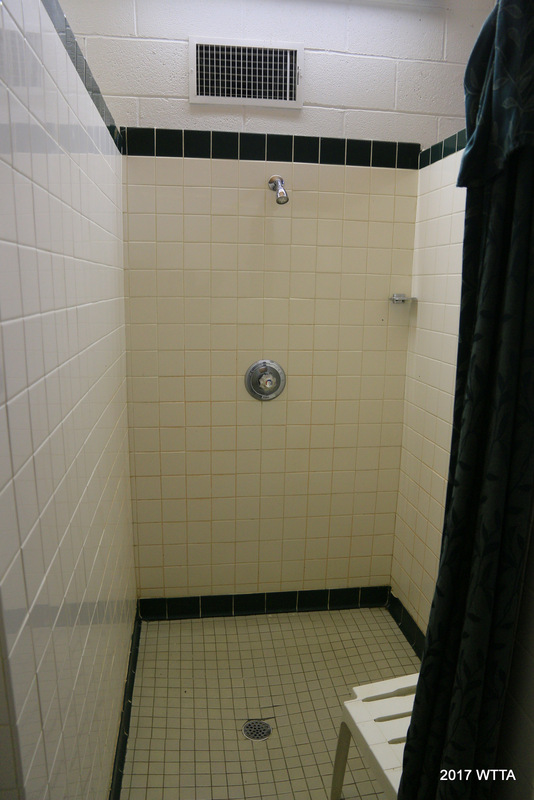 There is a shower house and restroom located in this area. This area can be reached by going through the North Shore Gatehouse. 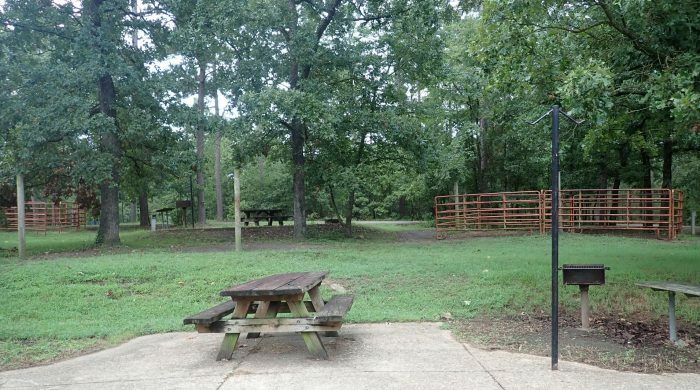 Other non-equestrian camping areas are located throughout the park and on the south side of the park. There are also primitive camping areas within the park that you can ride, hike, or bike to. On our way to SASP! Pets: Pets are allowed but must be contained or remain on a leash. In addition to our two horses we brought along our two dogs and one cat. Yes, one cat! This was my first time to camp with a cat and it actually went well and saved us $$ on boarding fees!. Itsy Bitsy had her own little pop up cat playpen, harness & leash, and she stayed in the trailer with us at night. 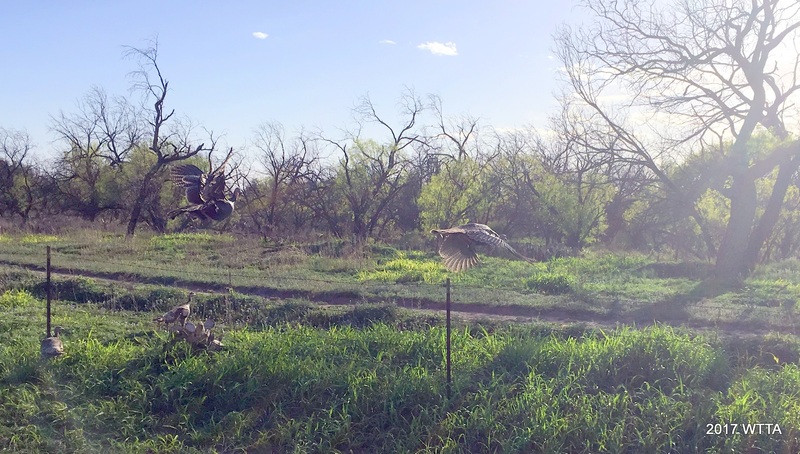 Park residents: When entering SASP we saw a rafter of turkeys taking flight. At our campsite we also saw owls and hawks. Our shady site seemed to also be the social hang out for all the park owls who were enjoying teasing our dog all night long. We received several warnings about rattle snakes but luckily I saw none on our trips there so far. We did see deer, javelina, and a wide variety of birds. Longhorns roam throughout the park. San Angelo State park is the home of the Official Texas State Longhorn Herd. I frequently came across these beautiful residents while on trail and learned that you go around them, not the other way around. It was really exciting when we were on a trail leading to a large water trough and the Longhorns were running from behind us, evidently to get to the water. 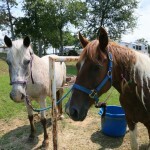 They were thirsty and we had to get our spooked horses out of their way fast. 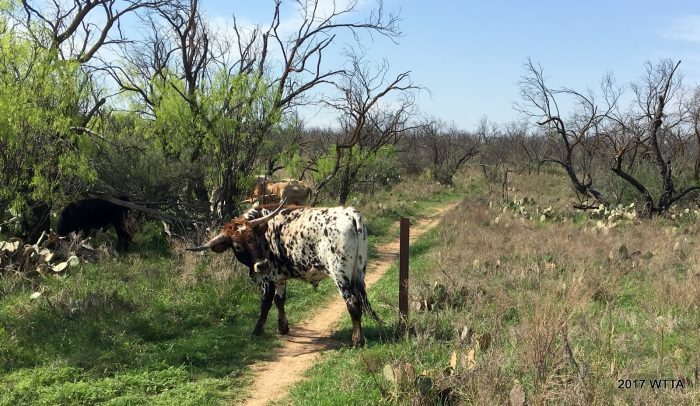 Quick note on trail etiquette for San Angelo State Park; everyone yields to the Longhorns! 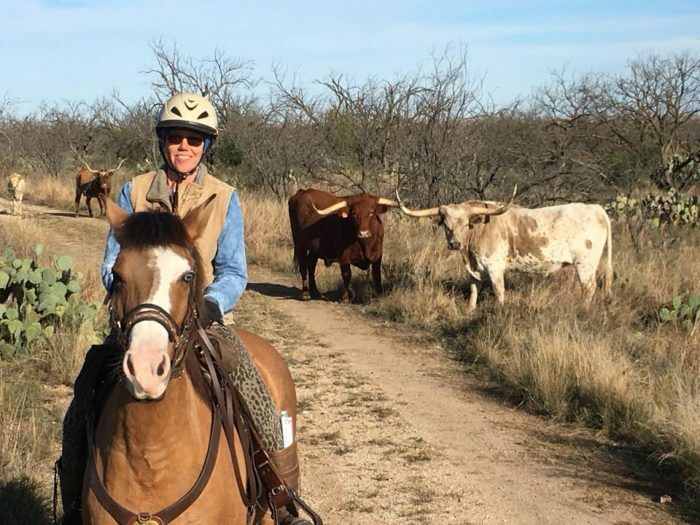 After we all settled down one of my riding friends, Kathy, took this great picture (above) of me on Angel with the Longhorns. On the south side of the park there is a herd of buffalo (they have their own section in the park and do not roam on the park multiuse trails). Check with the Park for Buffalo or Longhorn educational tours/events. Everyone yields to the Longhorns, go around! Cell Phone Service: My service with AT&T was good at this park. 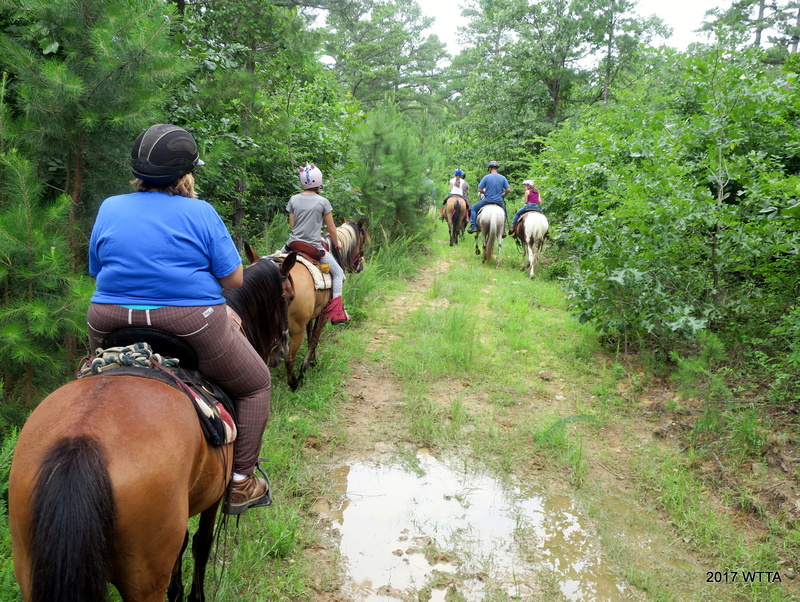 The bikers at SASP were very polite and quick to yield to our horses. 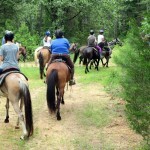 Trails Users: The trail is shared and divided between equestrians, hikers, and bicyclist. 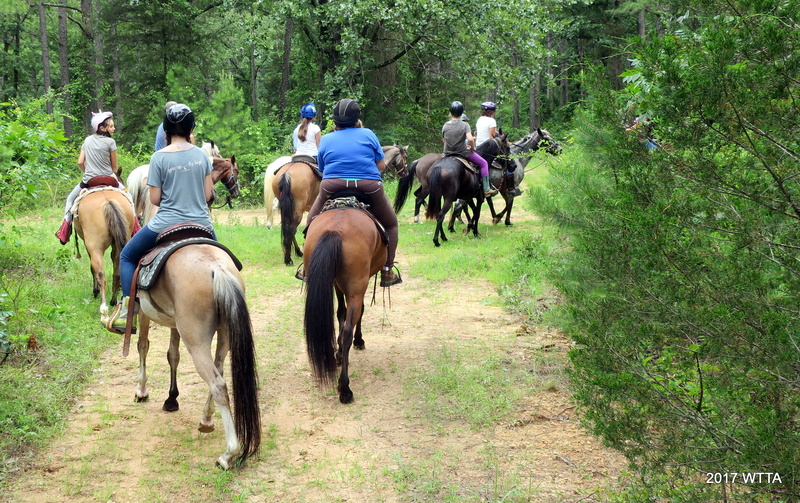 Everyone is to yield for the horse (except for the Longhorns and wildlife of course). No motorized vehicles allowed on trails. I saw several bicyclists on trail during both my visits to SASP in 2017. 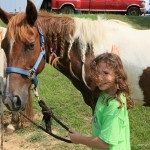 They were very courteous and careful around the horses. Mileage: SASP has approximately 50 miles of multiuse trails. Now that’s a lot of riding! The trail maps are not as detailed as the maps posted along the trail. 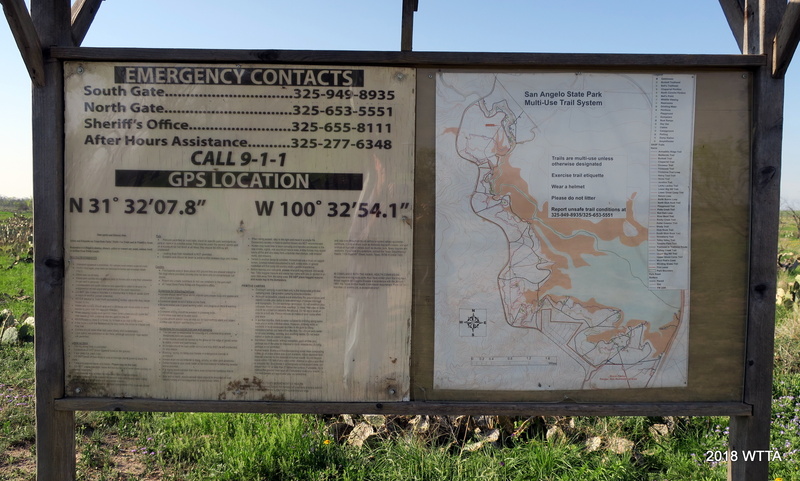 I suggest you take a good look at the map signs on trail as they are much more thorough and often have a “YOU ARE HERE” bullet on the map. I took a picture of one of the maps which is posted above. Trail Markers: Overall, I found the trail markers (mix of wood and metal markers) to be pretty good. On a few spots there were trail intersections that had no marking but I just stayed on what appeared to be the main trail and had no trouble. 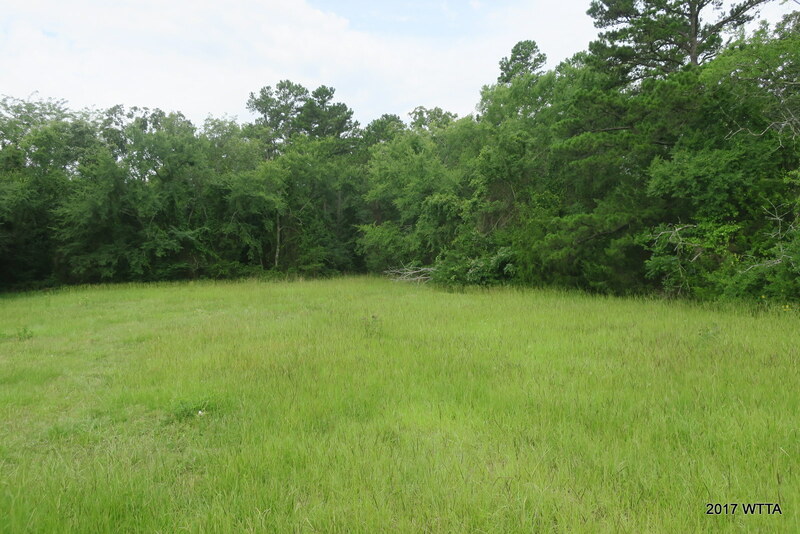 It is fairly easy to navigate this park because the trails are all in between the river and FM 2288. If the road is on your right and the river on your left, then you are heading south and away from the North trailhead… and vise versa. 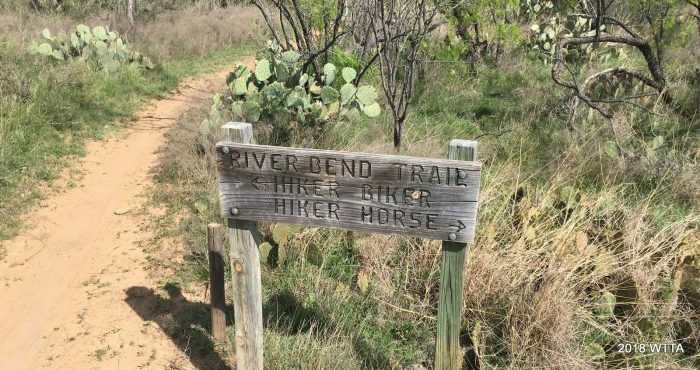 What is awesome about a lot of the trails is that they have separated the bike trails from most of the horse trails with hikers being able to go on either the bike or horse trail. 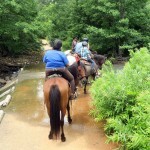 The bike trail often runs alongside parallel to the horse trail. 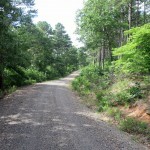 However, there are still some sections of trail that are shared by all users. 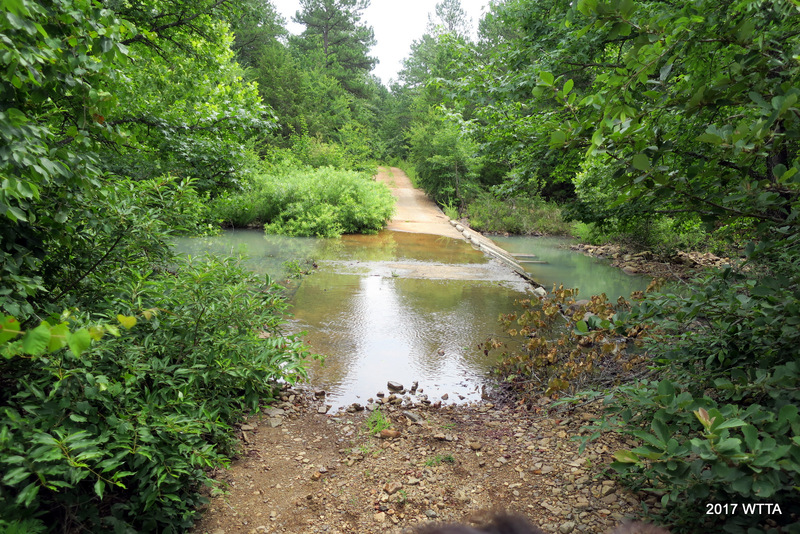 Water On Trail: Above is a water trough located at Burkett Trailhead which is marked at point number 2 on the maps. 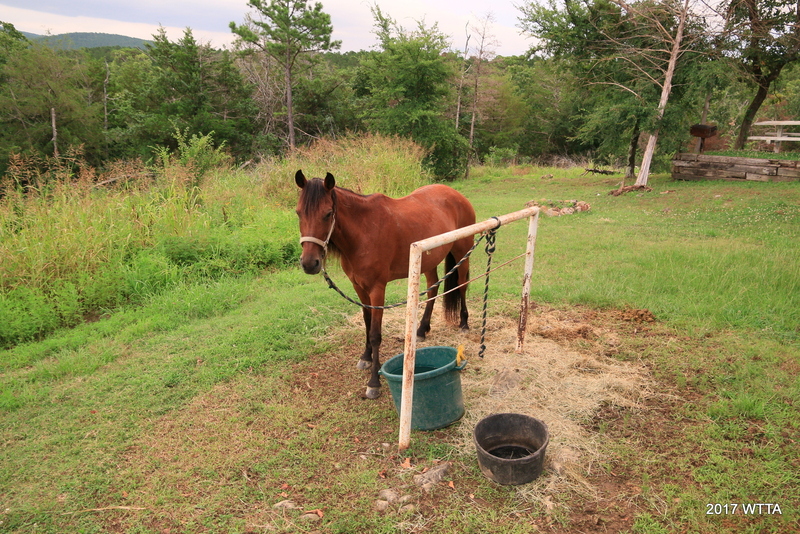 There are a few water troughs located on the trails. A water trough is also located on point 4 on the maps which is called Five Points (not sure why they did not assign it as point five on the map, lol). 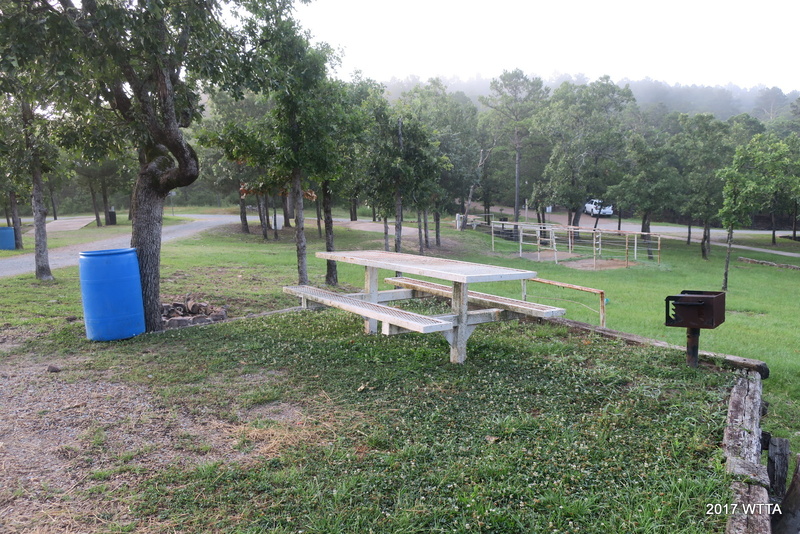 Another one of the water troughs is off of Dinosaur Trail closer to the equestrian campgrounds. 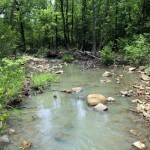 There are also a few streams on some of the trails that are most likely dry during the summer or dry seasons. 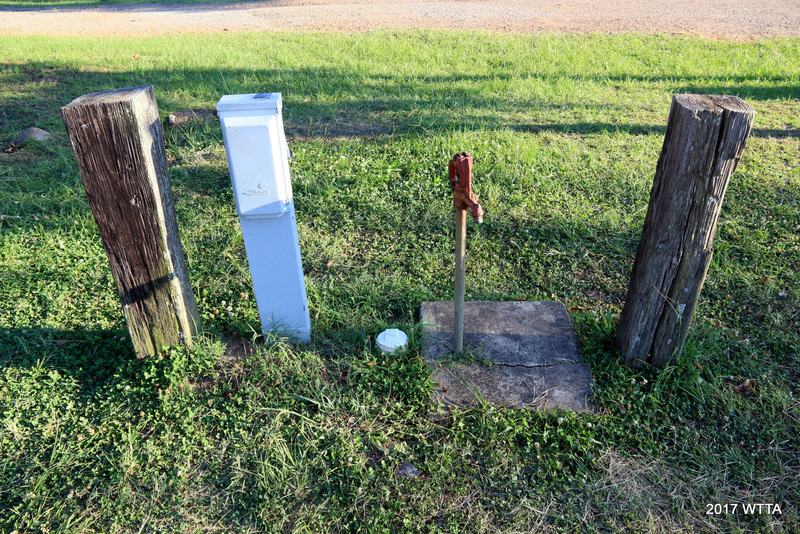 This gate is typical of most of the gate at the park and fairly easy to open and close by just lifting the chain off of the post. 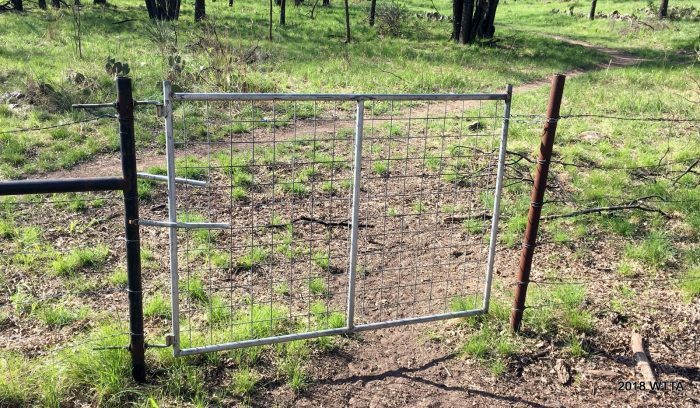 Gates: I will say there are several gates to open and close along the trails but most are fairly easy to open/close off the back of your horse while a few are sticky and tricky (being too close to the cattle guard making your horse nervous). So if your horse is not gate trained, ride with someone who can easily open/close gates or be prepared to dismount/mount as needed to get through them. This type of gate was more difficult to open by horseback. The cattle guard is too close to the narrow gate. You have to be careful of your horse not stepping on the cattle guard. This gate also had a spring instead of a chain so it springs closed on it’s own as soon as you let go of it. I dismounted for this one. Terrain: San Angelo State Park offers diversity in it’s terrain with four regions converging, Edwards Plateau, Hill Country, Rolling Plains, and the Trans-Pecos desert. 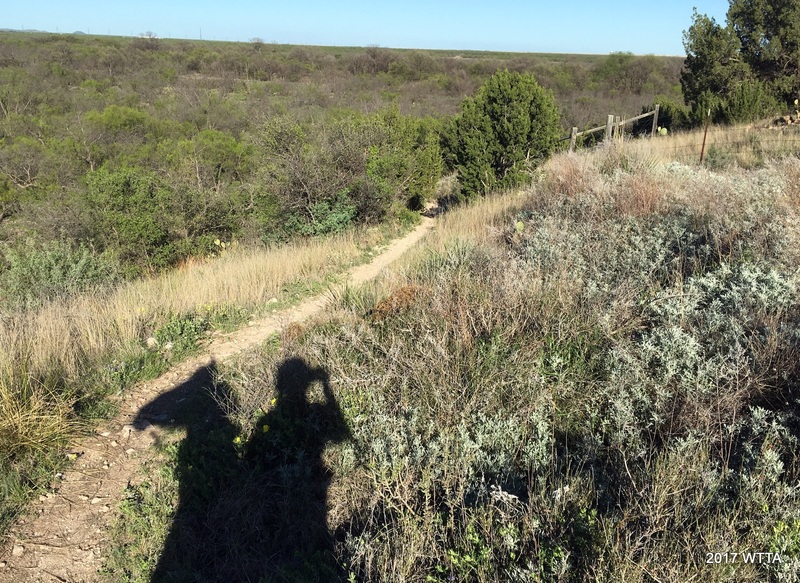 Most of the trails are fairly flat and level but there is a little Hill Country in Concho Land. Be ready for a few ups and downs in some areas. 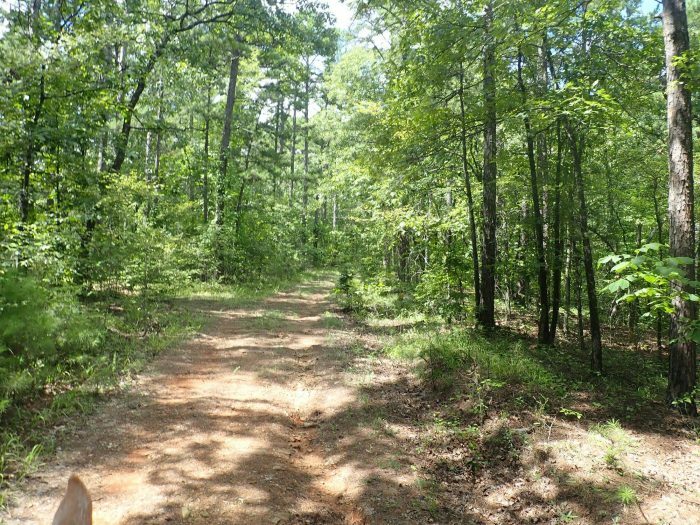 You can tell by the name of some of the trails if they will be challenging or not, such as Roller Coaster Trail versus Tasajilla Flats Trail.The ground varies from black dirt, sandy clay type soil, and hilly rock surfaces. 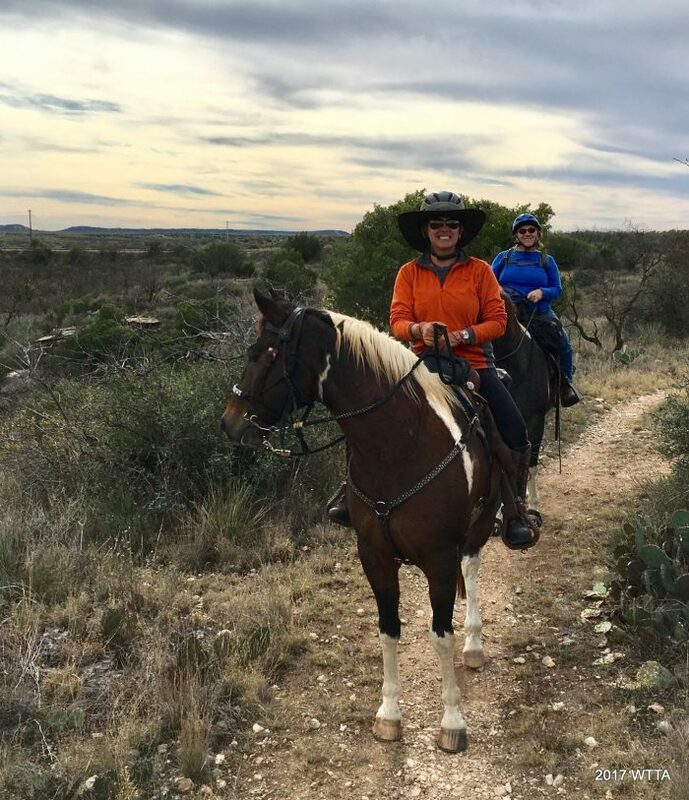 My horse got by fine barefoot but there are some rocky and hilly areas in which you may want boots or shoes on your horse. 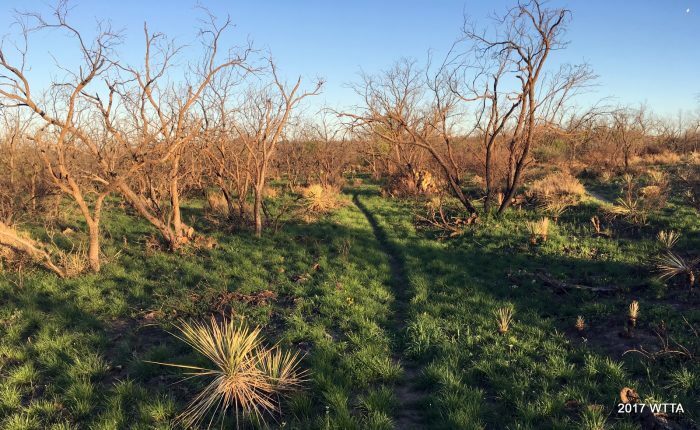 Some of the trails are wide open with miles and miles of catus but no tree coverage, while other trails have short brushy trees, lots of mesquite, and oak groves closer to the North Concho River. 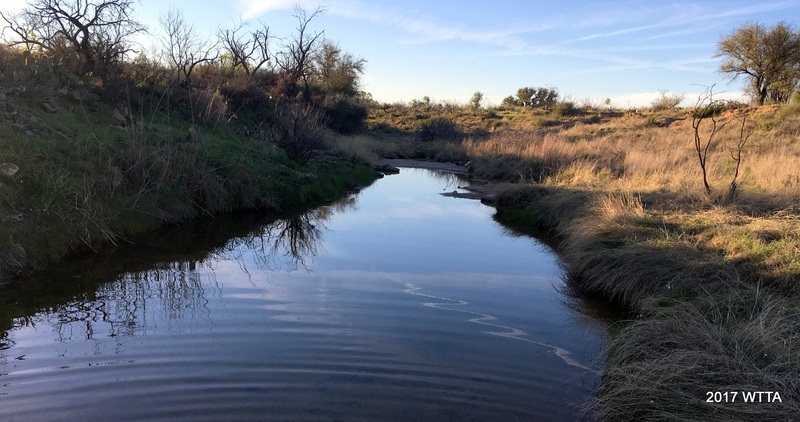 San Angelo State park is off the banks of the O.C. Fischer Reservoir and the Concho River. 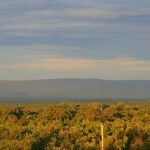 Opened in May of 1995, it is approximately 7,500 acres. My first equestrian camping trip to the park was March of 2017 but I was eager to return, going back in Nov. of 2017. I’d love to time my next trip when all of the prickly pair cactus are blooming, because they are everywhere. The park is really interesting and diverse in it’s landscape. The Reservoir water levels have greatly receded leaving behind several abandoned picnic and camping sites now far from the shores and over grown with cactus. While at the park be sure to check out the inviting town of San Angelo and it’s Fort Concho a National Historic Landmark. Angel and I at Cougar Outlook. hitching post and a giant bench at Cougar Outlook. Bike repair station at Cougar Lookout. Sorry Angel this won’t help you any. Cedar Lake Trail #4 overlook. Photographs and Trail Info Contributed by Carol Grosvenor. Thank you Carol! 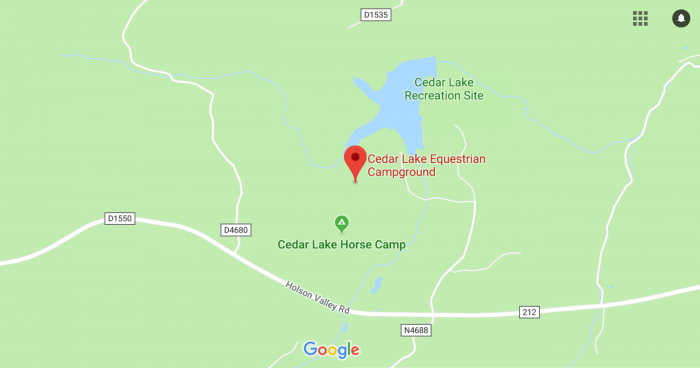 Cedar Lake is an equestrian campground in the mountains of the Ouachita (pronounced “Wa-Chita”) National Forest in southeast Oklahoma, off of Cedar Lake Road near Hodgen, Oklahoma. 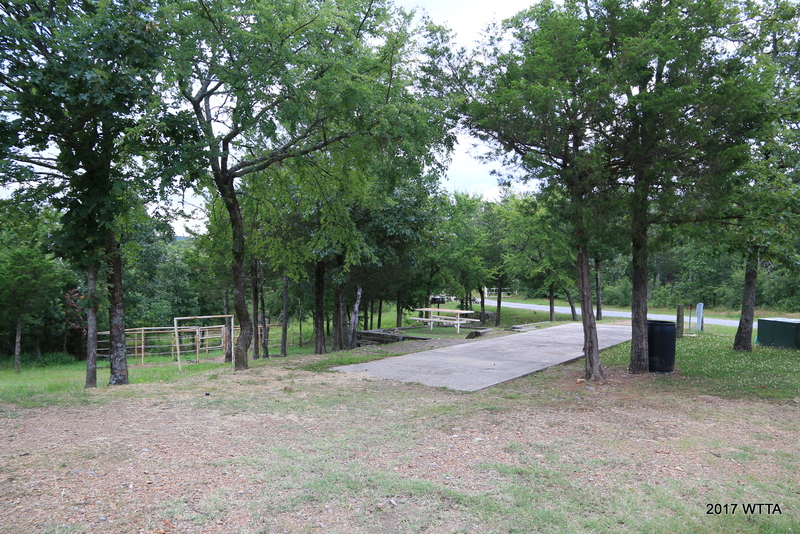 For campground questions and inquires you can call (918) 653-2991. Cedar Lake is operated by USDA Forest Service Oklahoma Ranger District, (580) 494-6402. 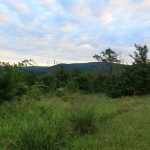 From Poteau OK, take U.S. Highway 59 south approximately 22 miles to Holson Valley Road (ten miles south of Heavener). Turn right (west) onto Holson Valley Road and travel approximately 2.5 miles. 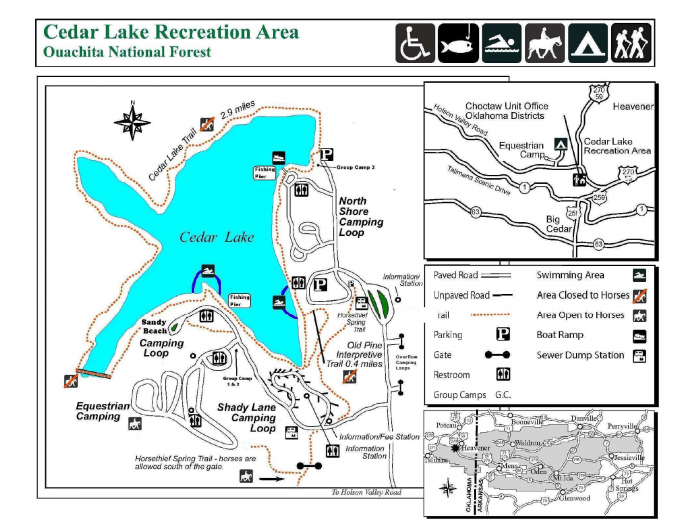 Turn right (north) onto Cedar Lake Road and travel one mile to the camp boundary. 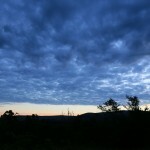 From Talihina OK, take U.S. Highway 271 east toward Poteau for 11 miles. Turn right (east) onto Holson Valley Road and travel 19 miles to Cedar Lake Road. Turn left onto Cedar Lake Road. 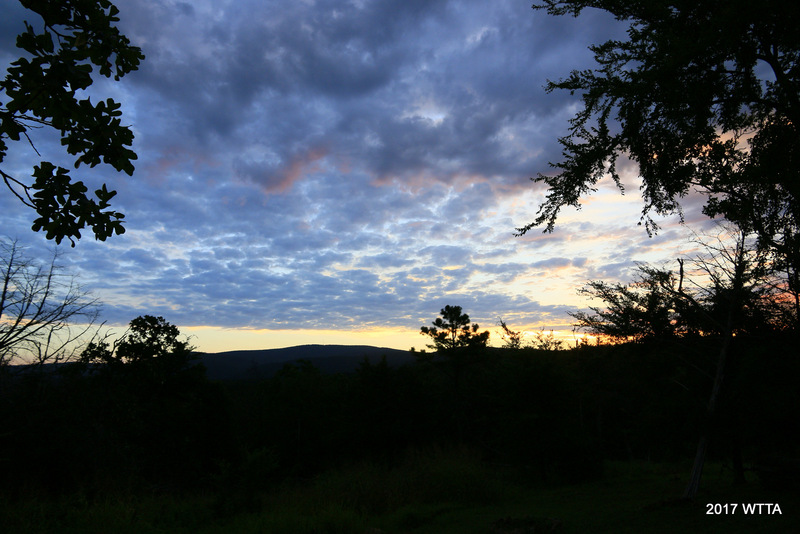 From Austin, the drive is approximately 450 miles, although we made a midway stop at Cooper Lake State Park to avoid arriving at night. I would advise trying to arrive in daylight, as this area is heavily wooded and dark. Upon driving across the Oklahoma border, we hit ten miles of very bad road, but that ended when we reached a former toll road. After that, the going was much better. We came in from the west and the drive on the last road into camp — Hodgen Valley Road — was 16 miles. There are two roads into the camp that you can take from Hodgen Valley Road. Top off your gas tank in Talihina or Clayton, as there isn’t any gas available on the way into camp from the west. If you’re coming from the east, the last gas station, which is also the closest place to buy ice, is the Tote-N-Poke, west of Heavener (pronounced “Heave – ner”) about five miles east on Hodgen Valley Road. 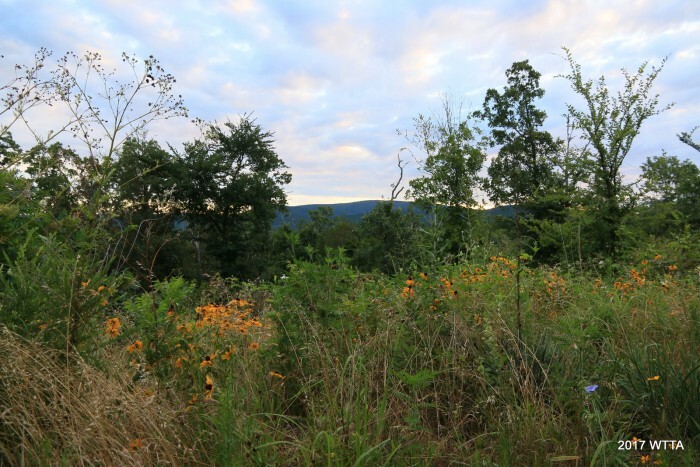 Heavener is the closest town with any amenities and has a medical clinic, feed store and restaurant. There will be a sign for Cedar Valley Road. Follow it and the signage to the horse camp. There are other campgrounds as well. All the equestrian sites have water and 20/30 amp electric hookups. There are no 50-amp hookups. 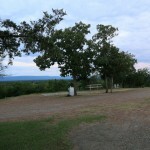 Some of the sites are available online, while others are kept open for drive-in use. When we were there, the camp wasn’t full, although it had seemed to be online. 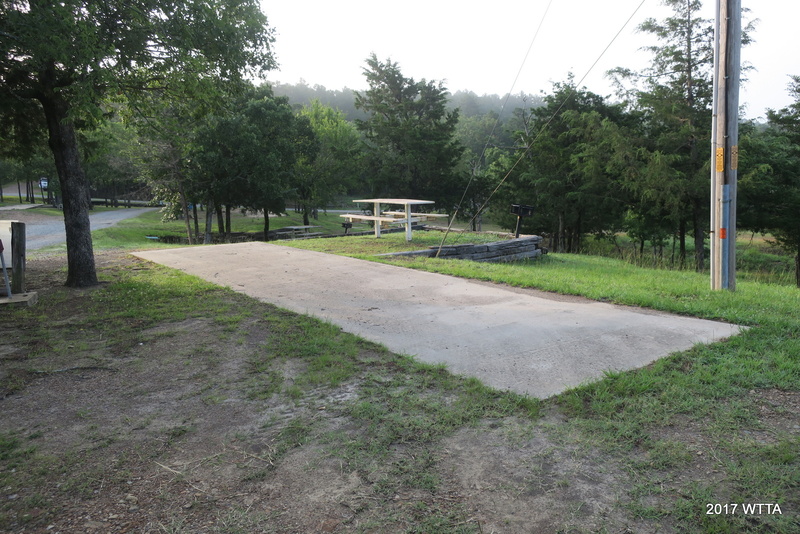 Each site has two metal pipe pens, a picnic table, a concrete pad, a pole for a lantern and a grill. The pull-through sites, like we had, are semi-circles. 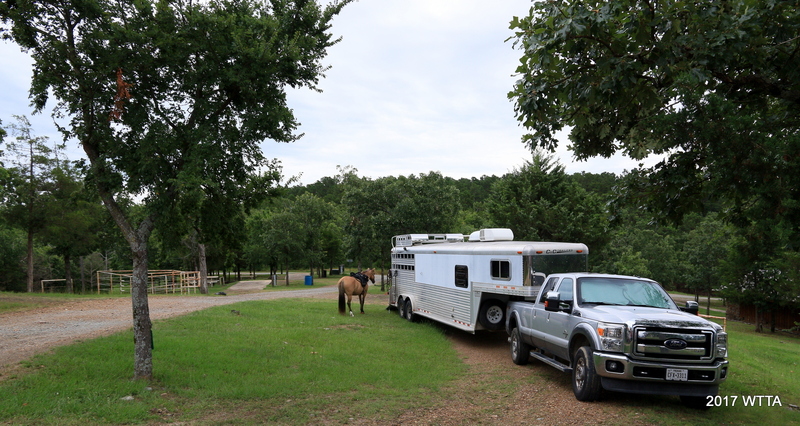 This campground was built years ago, so the pull-throughs are a bit short for some of the very long modern trailers. There are also some back-in sites. 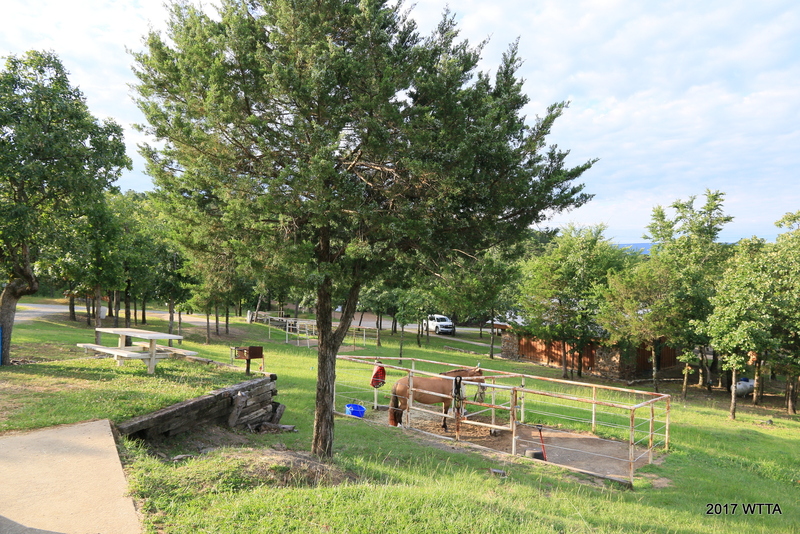 There’s a bathhouse with two showers; a pavilion, which can be used by groups; and a group shelter with another bathhouse down the hill from the main horse camping area. You will pass it when you drive in. 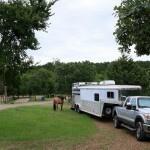 There is very little flat land for lunging your horse inside the campground, or other horse amenities such as wash racks, round pens, or arenas. Getting your manure picked up was easy. You simply pile it up beside the road, and once a week, someone comes by and collects it. 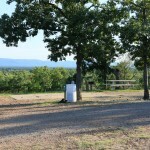 Outside the horse camp there is an RV dump station which also serves other camping areas. Trail Heads: See above map for trail head entrance markings. 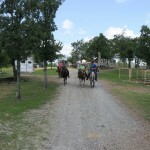 There are 3 places from the campground to enter the trails. You will find a black and white Xeroxed trail map at the kiosk. I wish the map had been bigger, but it was still quite helpful. 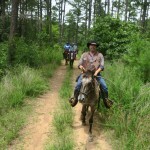 We had an experienced “mule guy” give us information on the trails before we started riding. 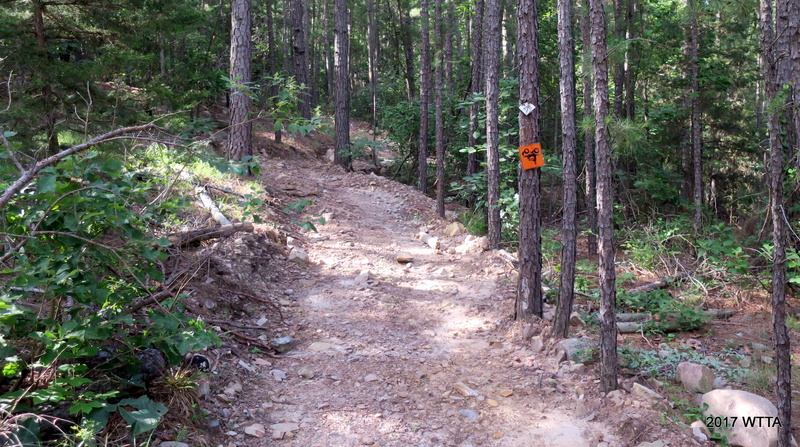 The trails are all numbered with yellow and black signs nailed to trees, and the signage was clear most of the time. Most of the trails are about ten miles long, but you can put multiple loops together for longer rides. 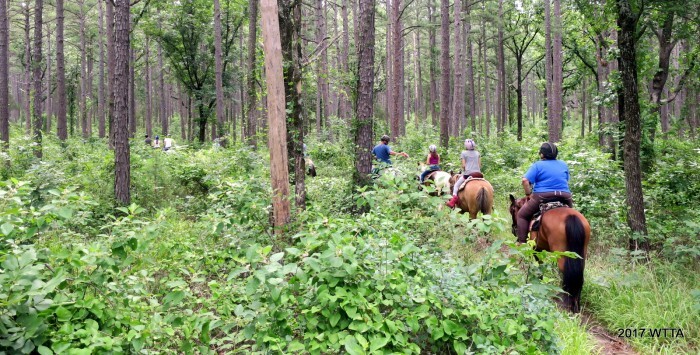 There is one trail that can take you out to a restaurant, but it would be a long ride (25 to 30 miles) out on Trail 1. 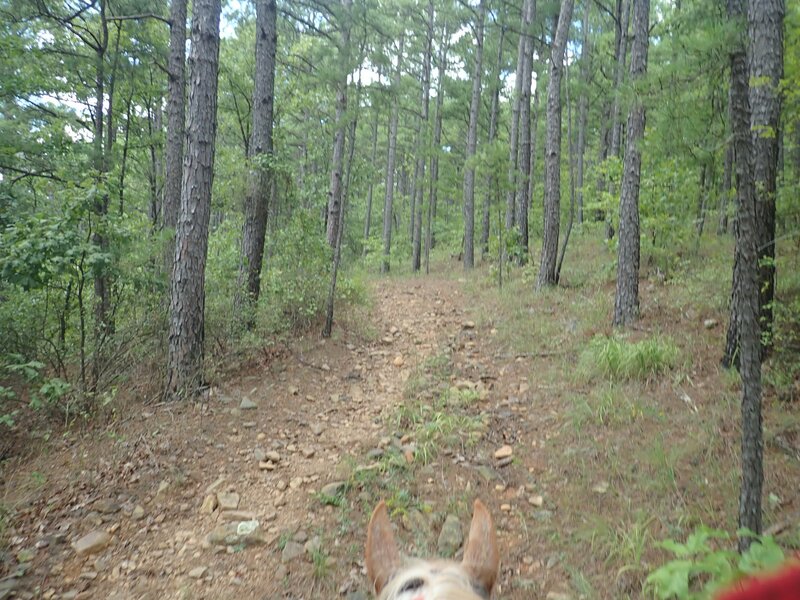 We rode Trails 1, 2, 3 and 4. We didn’t ride all of any of them, though. There are also some short cut trails numbered A, B, C and D, as well as a few cut-through service roads. We rode Trail D several times. The footing was mainly sandy loam and rocks. It wasn’t slippery, though. The rocks appear to be flint, as many were sharp and broke into rectangles. 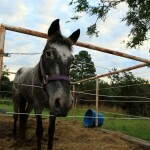 Horses should be shod to avoid stone bruising. We rode mostly at the walk. There were a few places where one could move out, but mainly it is slow, careful riding. 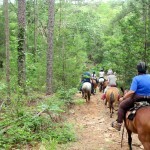 I would recommend this place for experienced horses and riders, due to the terrain and length of trails. In some places the trails were double-track, but most were single track, and there were many switchbacks. 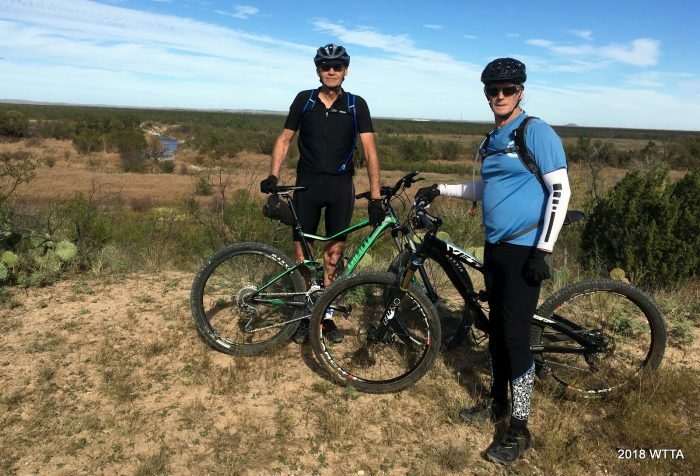 With at least 70 miles of trails, we never saw anyone else riding. It was quiet and peaceful. We were told we might see bears at high altitude, but we saw no bears… only butterflies, deer, and one snake. The elevation of the camp is 900 feet, but there is quite a bit of elevation change out on the trails, which is evident by looking at the topographical maps. 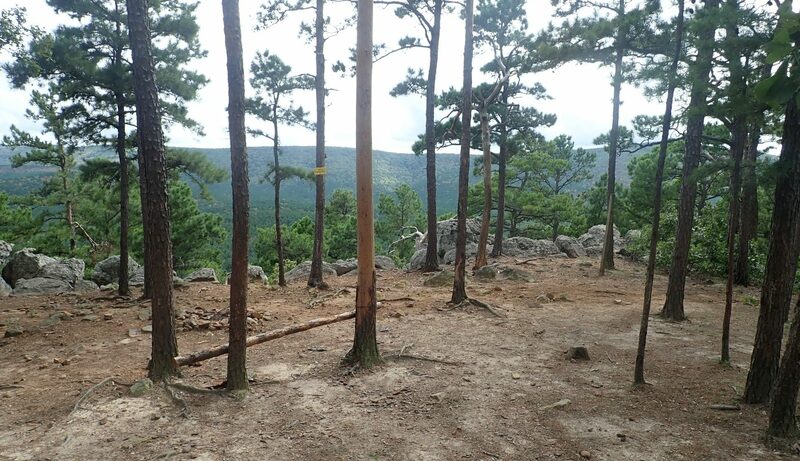 The highest trail we rode was Trail 4, and it has a nice lookout point on it. The lowest trail is 2. We were told Trail 2 was flat, but I wouldn’t call it that. It was flatter, but it still had some elevation changes. 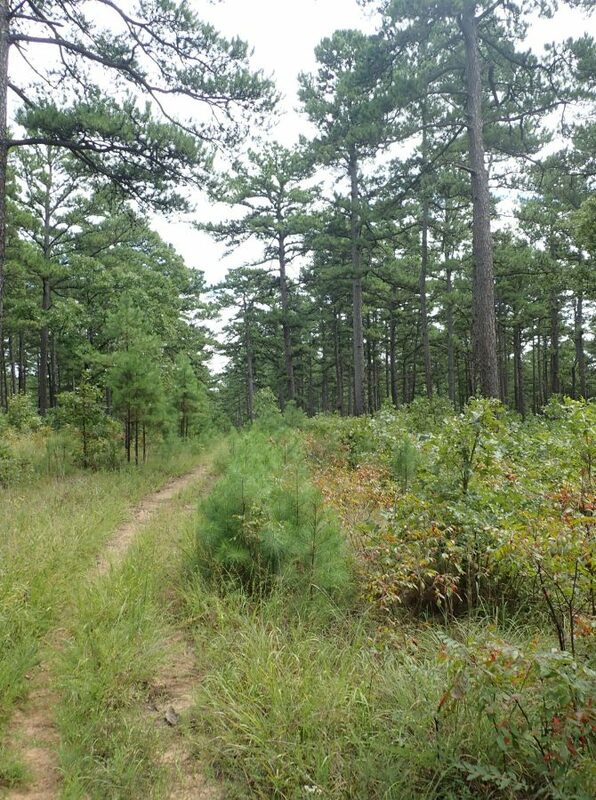 Some of the forests on Trail 2 were oak, but on most of the other trails at higher altitudes, it was pine. 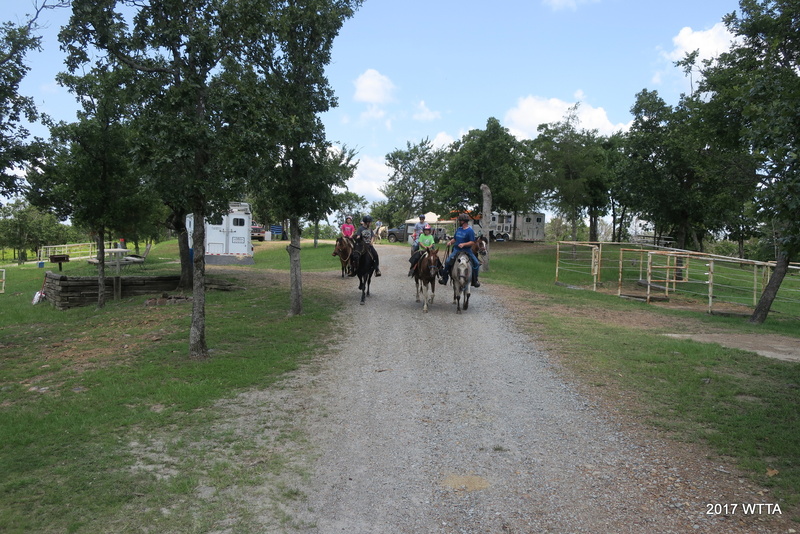 Almost all the riding is shade, so although it was humid, it was cooler than riding in direct sun. 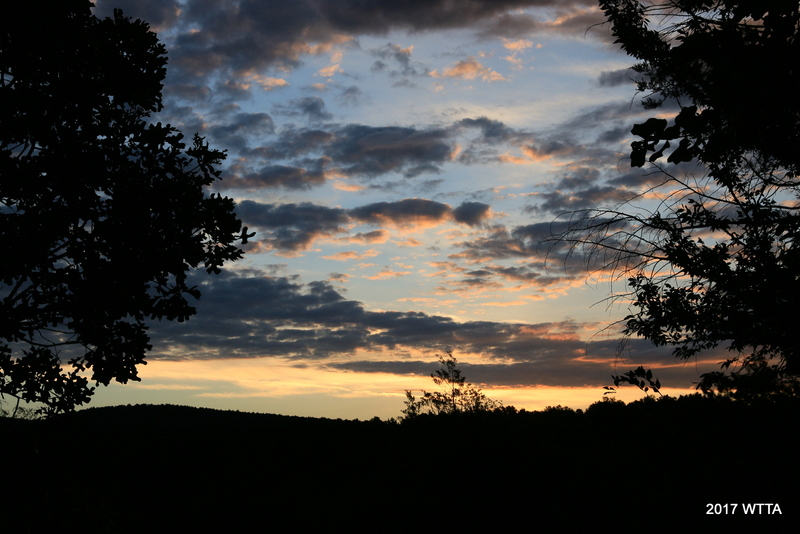 We arrived after several days of rain and the high temperatures were high 70s and low 80s. The camp host said the best time to come is the spring while others said October. One of the views from Trail #2. If you come camping here, bring more fly spray than you think you will need. I had to apply more spray along the way on the rides. They bothered my horse, but not the other horses, for some reason. 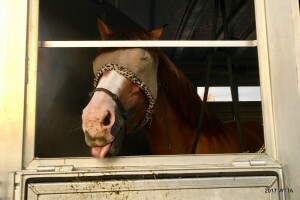 My horse wore a flysheet in camp as well as a fly mask, and that seemed to help. She hated the flysheet rump rug I bought her, but if your horse can wear one, that would be a good idea. Also, there is no way to buy ice at camp. You have to drive into the Tote-N-Poke, about seven miles away. Some people bring ice makers with them, and thought they paid for themselves quickly. 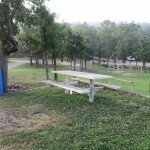 We carried food and drink with us on the trail, and came upon a picnic table off of Trail 2. This was close to a lake, although I couldn’t tell where it was on the map. 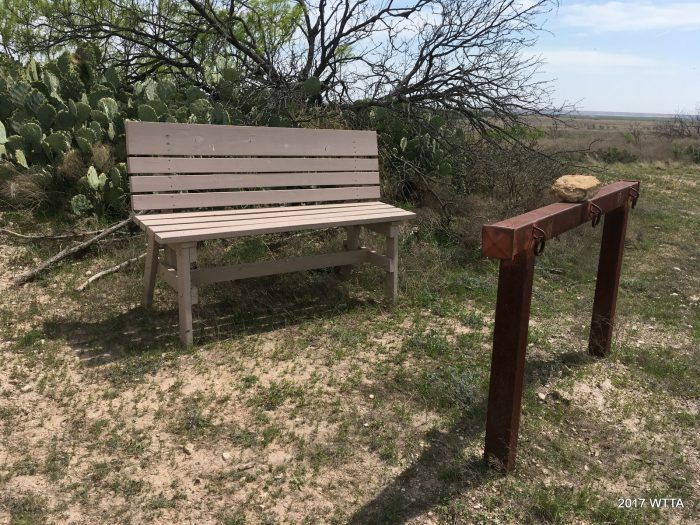 That was the only picnic table we found on the four trails, but there is a lookout point on Trail 4 where someone has placed a bench, and that is another nice place to stop. While we were there, the lake was experiencing a blue-green algae bloom, and the water in creeks looked murky. 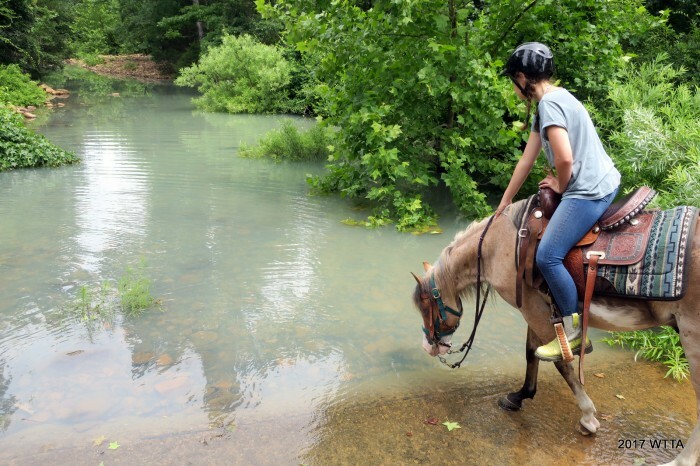 There were a few creek crossings, but we were instructed not to let the horses drink from the lake or streams because of the algae. Plan accordingly, because there may be no water available on trail. Cell phone access on AT&T was not good unless we were at high points or at the Tote-N-Poke, but others said they had cell phone access with Verizon. 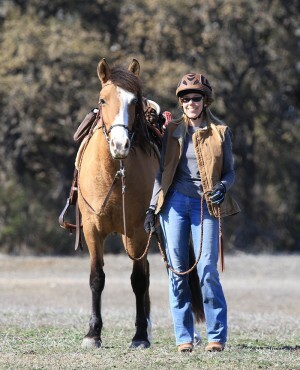 WTTA contributor Carol Grosvenor and her girl Bug. Rosalie Faye Lorenzen, a friend of mine from Brenham made this trip with me the second week of September 2018. 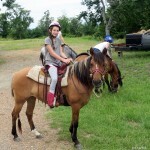 It was my first ride in Oklahoma, but she had been there about twenty years ago. 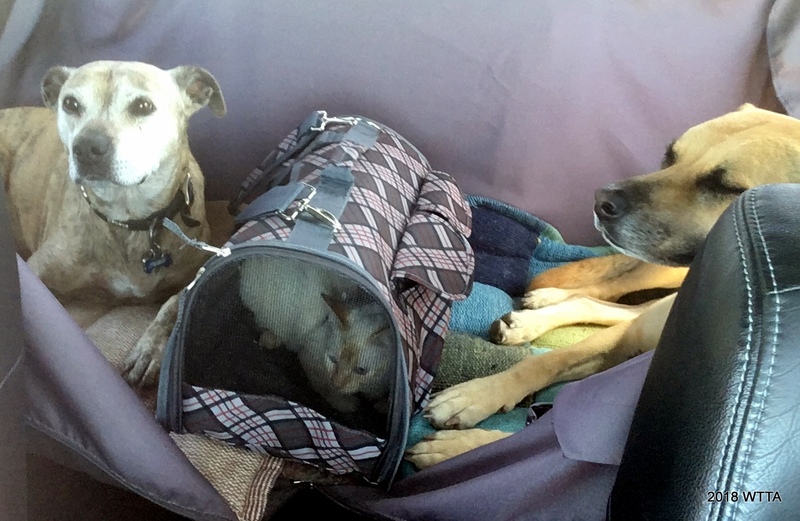 The two of us drove up in our own rigs, with Bug and Smokey in tow. 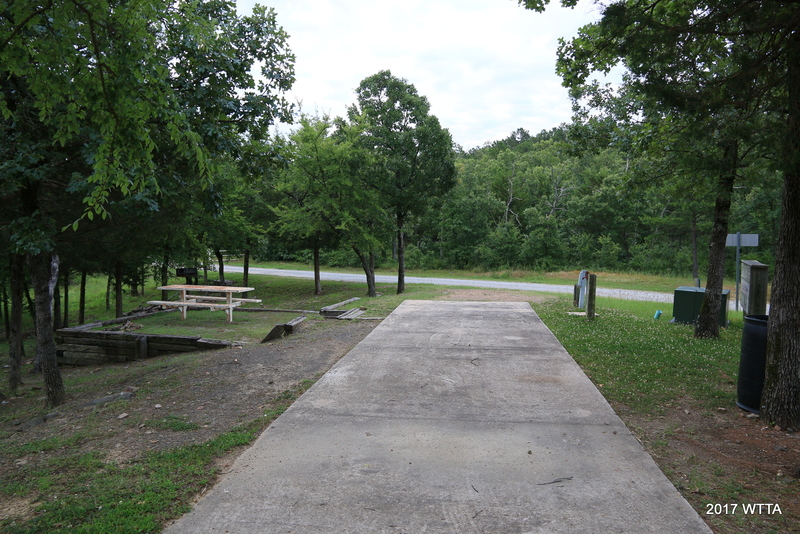 This park is about 500 miles from Austin. We had nice sites across from the shelter and the bathhouse, in the middle of the camp. 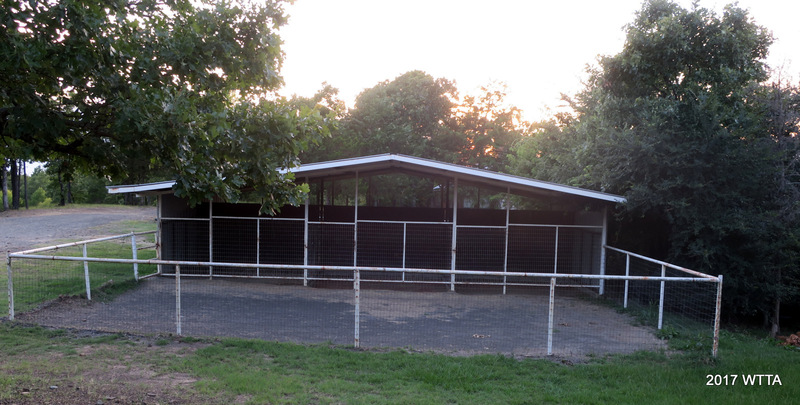 As you can see from the pictures, there was no flat place to lunge a horse, but I did find a place for the screened shelter, which was really comfortable in the evenings. 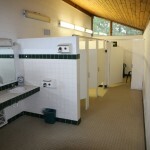 All sites have electric and water, and the bathhouse is convenient. The visitors seemed to be mainly retired people in their 50’s through 70’s, very serious riders, and many came from very far away and were staying about a week. This is not a place I would recommend for really green horses or green riders. It is pretty remote. There is no cell phone access there on AT&T and only a little on Verizon, and no night life or ice without a drive, so if you go, you mainly go to ride. We’d find a high place to check our phone messages every day. Having no knowledge of the outside world was pretty weird in this plugged-in age. I still don’t know what happened last week! 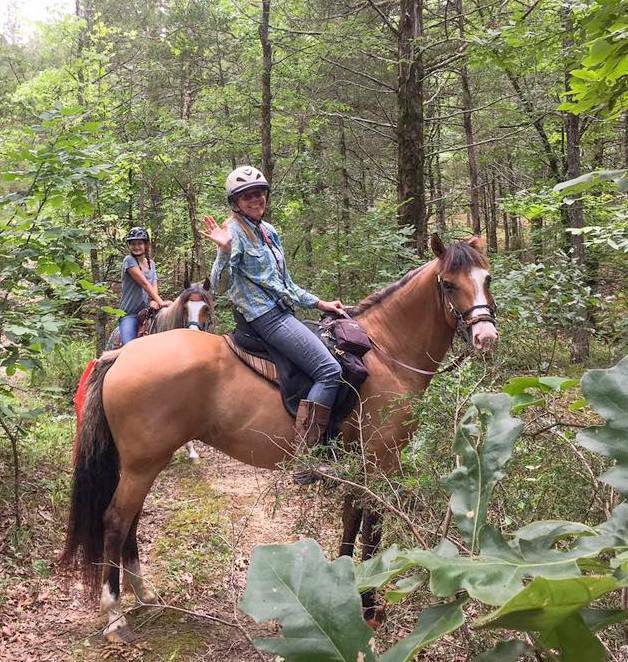 This was Smokey’s first ever trail riding experience, and he did real well, mainly following Bug after she got over being assaulted by bugs on the first day. Oddly, they didn’t bother Smokey, even as they stood in their pens. Bug had them all over her feet, while Smoky had none at all. Bug had a meltdown the first day because of the flies, but they got a bit better as it got drier, and I guess she got used to them. These flies were the size of June bugs, and they hurt if they bite you. Ask me, how do I know that? Because I didn’t bring enough fly spray! If you go, bring twice as much as you think you will need. 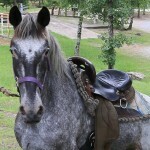 I tried some special clothing on Bug for the flies, but she didn’t like it, except for the fly sheet she wore at night. We heard there might be bears, but we saw no bears or pigs or any critter particularly alarming or exciting. We did see one snake and some deer, though, and many beautiful butterflies, as well as lightning bugs in the evening. This place is so big, we also never saw another rider or hiker on trail. 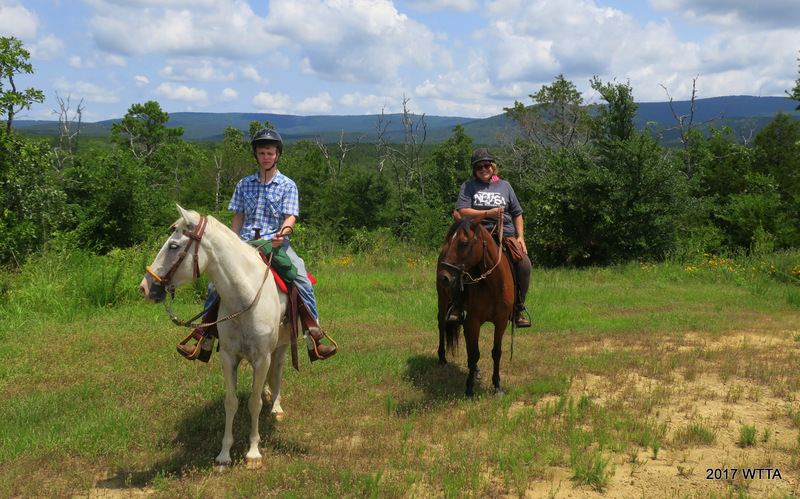 We were able to ride for three days, about ten miles a day. That doesn’t sound like a lot, but they were hard miles… lots of elevation changes, and many sharp rocks. Bug was too sore on the fourth day, so we started heading back. The weather was very nice. There was very little rain (only once in the afternoon), high 70s during the day, and mostly cloudy. The trails are almost all under the cover of shade trees, so it stayed quite cool. 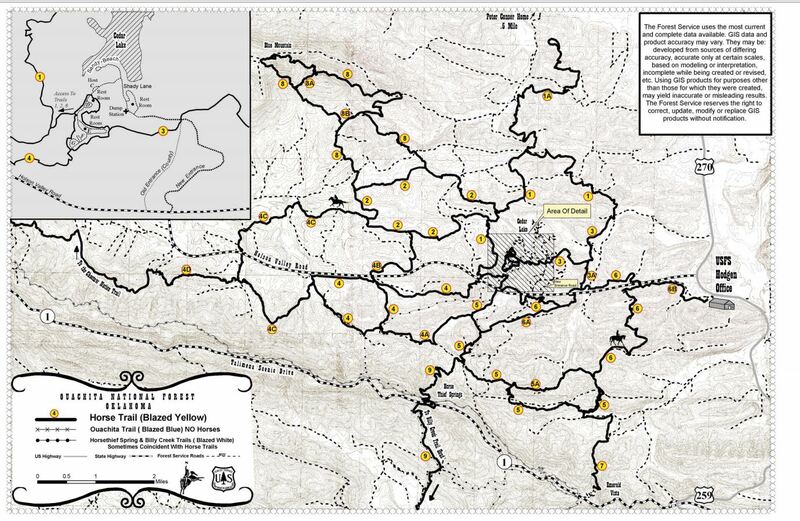 If you look at the maps, you’ll see trails grouped by numbers. Most of the trails are about ten miles long, so if you put two of them together, you can get a 20 mile ride. It takes awhile to do them, as very little of it is fast terrain. It was much steeper than it looks like in the pictures, due to the fact that I am only coordinated enough to take pictures on the flatter areas. Trail 2 was the lowest, flattest trail, and on that trail, we were sometimes in pine, and sometimes in oak forests. Most of the other trails are in pine. The high point pictures were taken on Trail 4. Of course, there was a Mule Guy (there’s always a Mule Guy at these places). 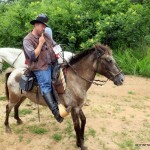 Mule Guy gave us the info on which trails to ride, the short cuts, what not to ride, etc. 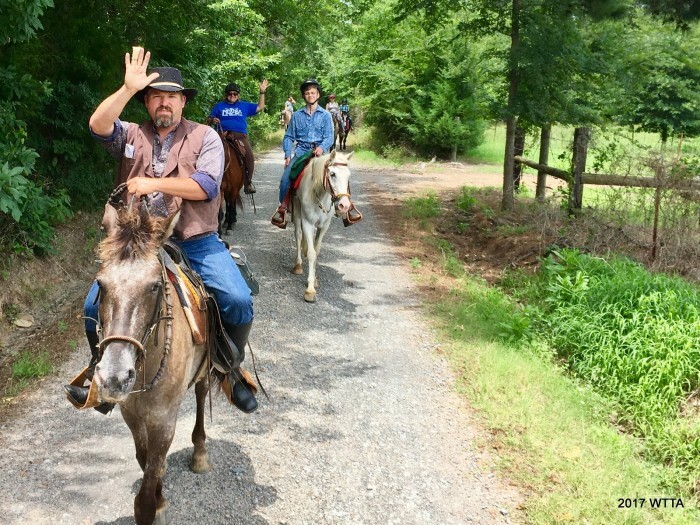 One lucky group got to ride out with the Mule Guy, but unfortunately, we never did. He was off trail the whole time, though. The trails were pretty easy to follow, although we did get lost the first day on Trail 1. We were not able to get near the lake, except for once, on Trail 2, where we were able to see a lake. But I’m not sure it was Cedar Lake. Trail marker for trail #2. 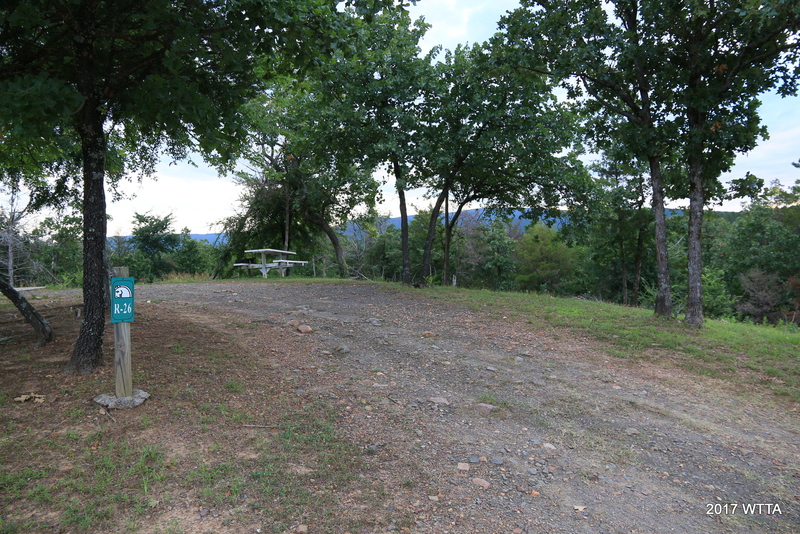 We found only one picnic table on the trails, and that was on Trail 2. I’m a big fan of picnic tables, so I always look for them. Most of the trails were way too narrow to have one, as many are on switchbacks. We ate lunch there. I would go back again. The camp host said the best time of year was spring, but this was pretty good. We escaped last week’s rain and the heat. It reminded me of both Ebenezer Park (except for the rocks) in Texas and Gillespie Ranch in New Mexico. Location: Located in the Ouachita National Forest near Talihina in southeastern Oklahoma. Directions: Coming from Talihina, take 63 East for approximately 6-7 miles. 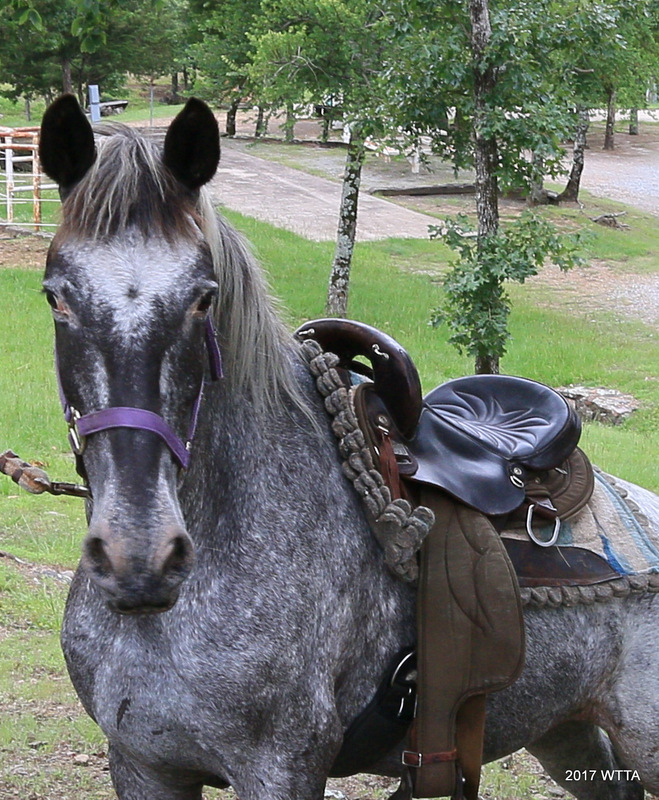 You will see a blue road sign alerting you to Horse Heaven. Turn left at the white fence and the Horse Heaven rock sign on the left. Go approximately one mile on the gravel road. 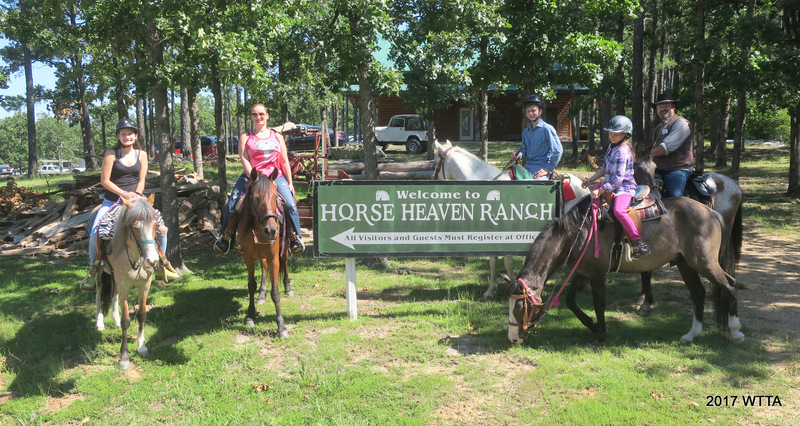 You will see another Horse Heaven sign on your right. 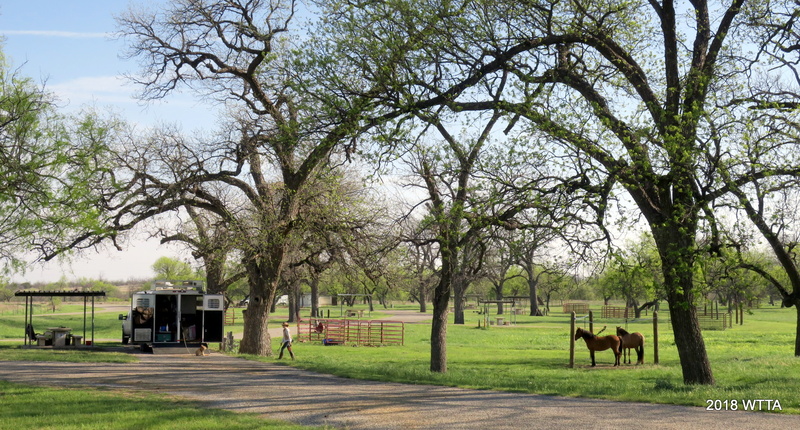 On the right is the barn and this is also where the office is located. On the left you will see the arena. 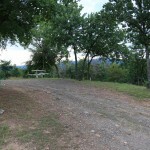 Campsites are further down the road and the Cabins are the furthest back. GPS N 34 42.965 W 094 55.740 (note google maps is incorrect as it shows the address located in the city of Talihina). Elfie said she really does not have a title at Horse Heaven, she just helps out. She has been there for about 14 years now and lives on site. 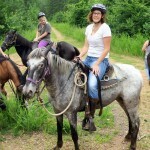 She found the place due to her love of trail riding. She works on keeping the trail clean and enjoys helping out. 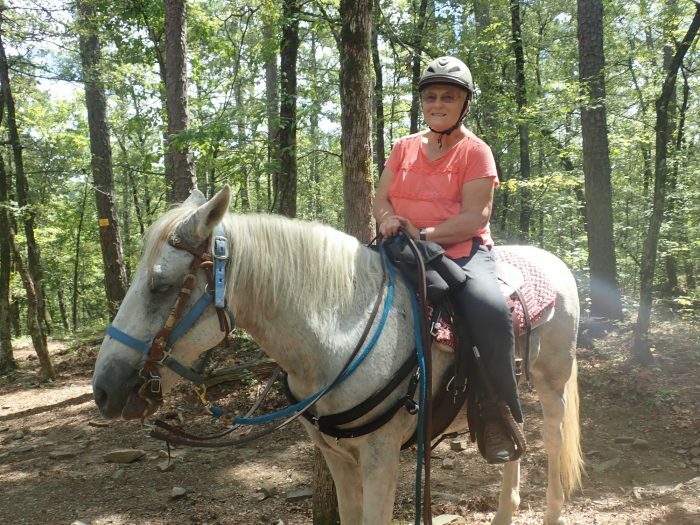 She is the trail rider that never left. 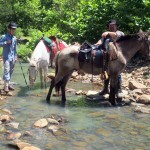 Camping: Overnight camping with horses is allowed and encouraged! 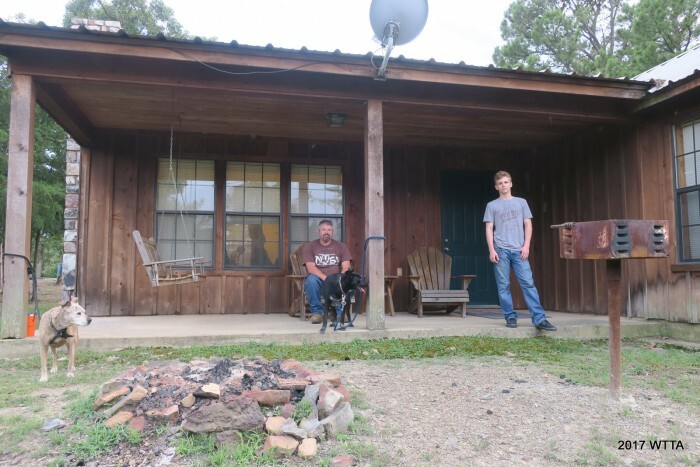 $142.76 – $174.48 a night for the 1 or 2 bedroom cabins for 4-6 people which include 2-3 stall barns with loafing shed. 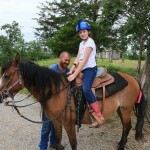 Extra fees may apply for additional persons/horses. 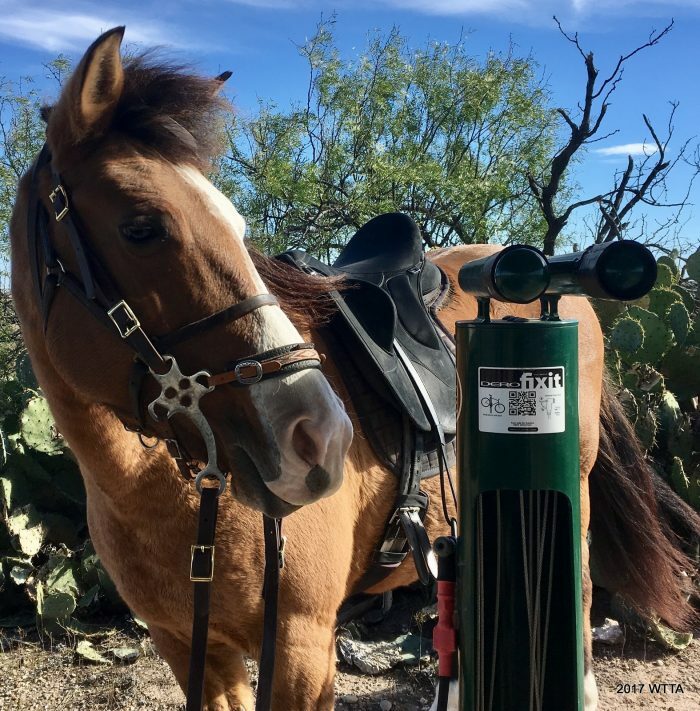 You are also allowed to set up your own electric pen or containment for your horse on the campgrounds if you want them to have more space and be able to graze. 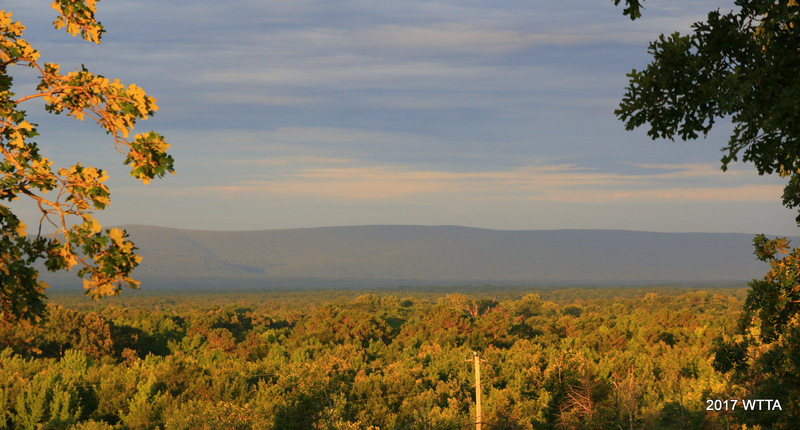 Many camp sites have great mountain views to the north and south. Lots of shade trees are all throughout the camp. The camping area is hilly. 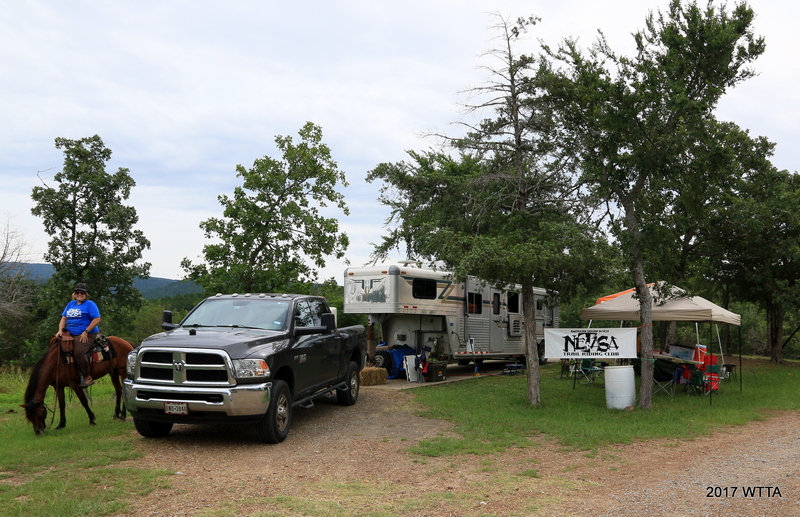 At some of the sites the parking pads are at a different level than the horse pens which requires you walk up and down an incline to go from your RV/trailer to the pens. 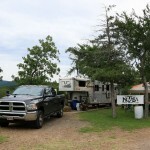 My site, #25, had a pleasant view of the mountains to the north, but there was a fairly steep grade from where my trailer was parked to where the horse pens are located. Many other sites are level. 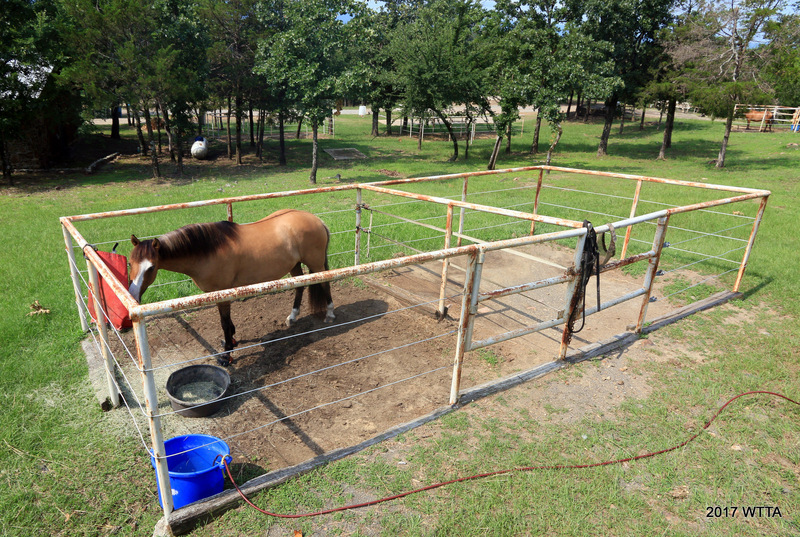 If that makes a difference to you, then be sure to ask for a site that has a pad fairly level with the horse pens. The pens are close to the pads. 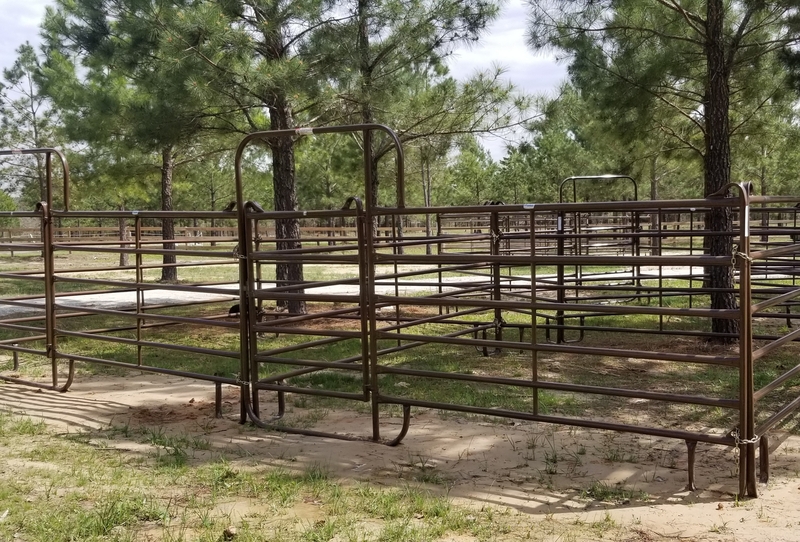 Some of the pens are in very good shape while others need repairs and have temporary fixes like bailing twine or straps/ropes used for the railings on the center divider. The pens are pipe and the rails are rubber coated wire. The two pens are adjoined, sharing a center divider. 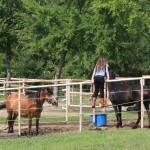 Not all horse pens are in the shade. 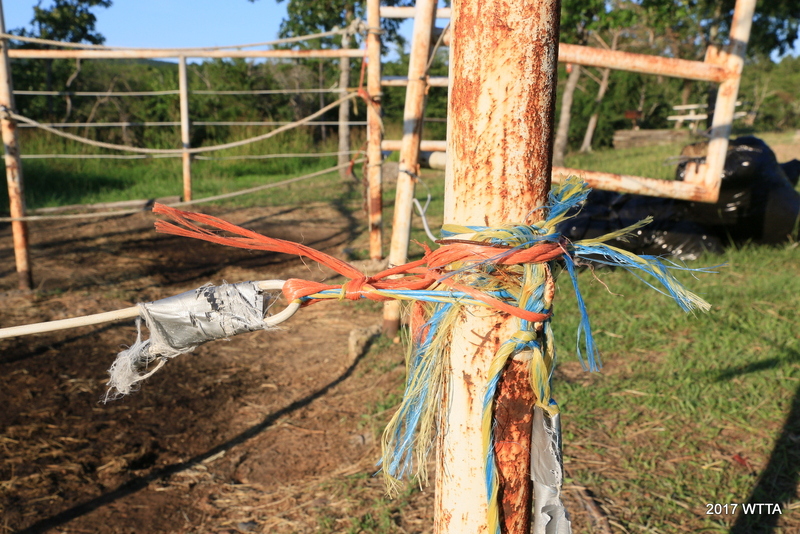 You are also allowed to set up your own electric pen or containment for your horse on the campgrounds. Bring your own water buckets and water hoses. 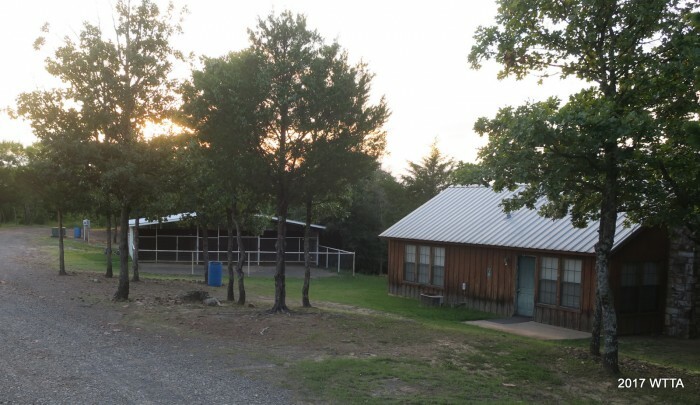 Cabins:There are six one to two bedroom cabins each with an adjacent covered 2 to three stall horse barn and attached open paddock. Cabins are fully stocked with bed linens, a full kitchen, living room, bathroom, fire place, covered back porch, grill, and fire pit. The cabins are cute and fairly spacious. The cabins have a nice covered back porch with a swing and chairs. 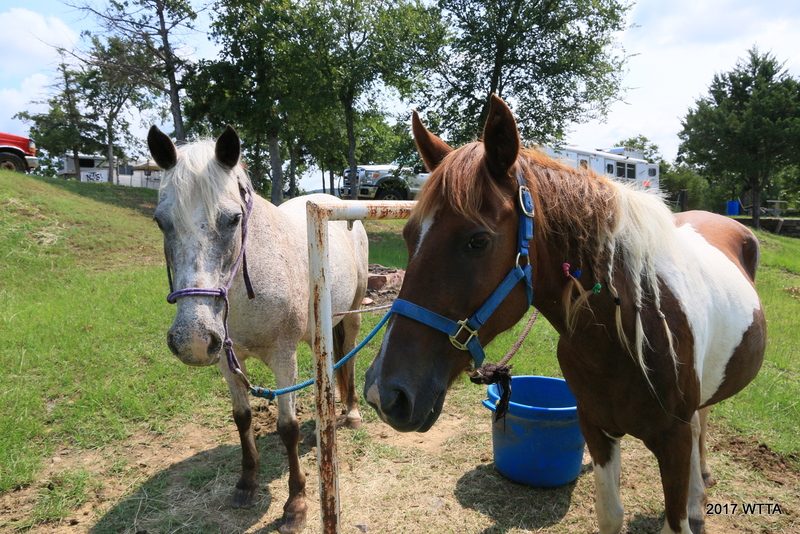 Bring your own water buckets and hoses for your horses. 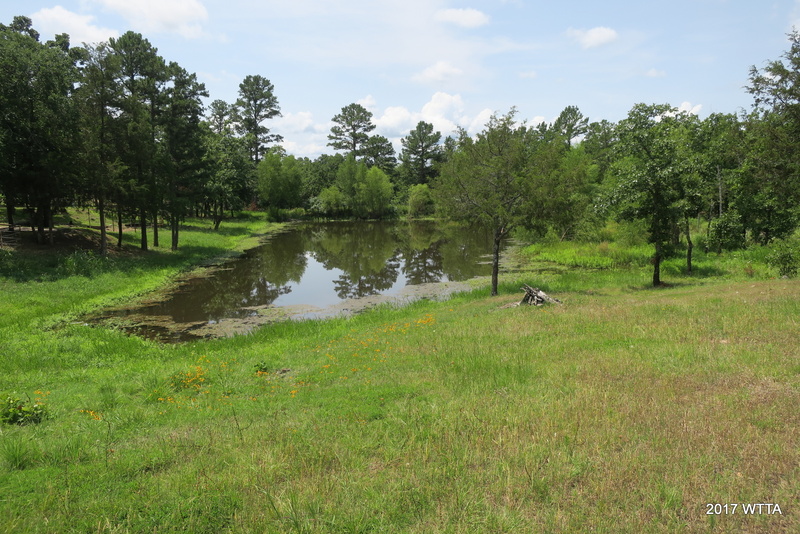 Near the cabins and with in view of cabins 5-6 is a three acre pond stocked with catfish, bass, and perch. Cell Phone Service: My AT&T phone worked well in the campground and on the trail. You can see two AT&T towers on top of a hill at a distance north of the ranch. 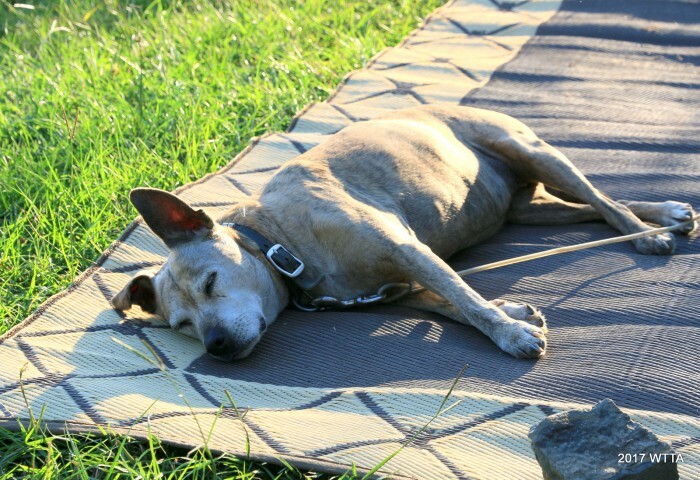 Dogs: Dogs are allowed but are to be on leash in the campground, however, they may go out on the trail with you. They are not allowed in the cabins. 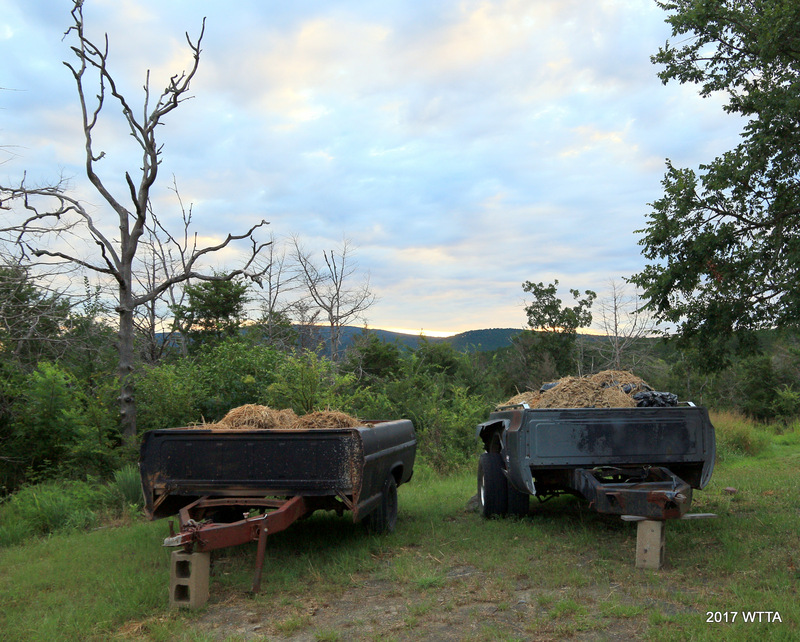 Manure Management:: Bring a manure fork, muck bucket, and several strong trash bags. You will need to bag the manure but can leave the bags to be picked up. 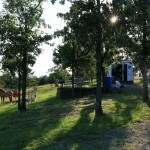 There are also two truck beds on the north side of the RV camping area that manure can be put in. Tracks pointed out by one of our NETASA riders, Curtis. 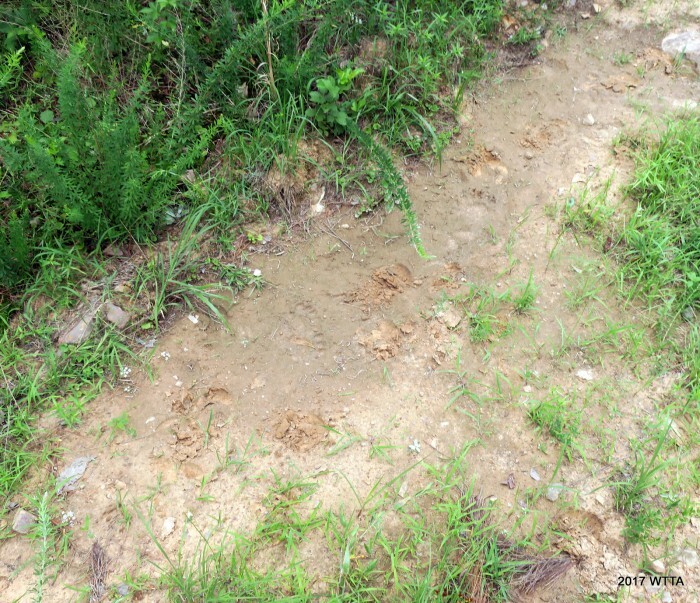 Are they bear tracks? 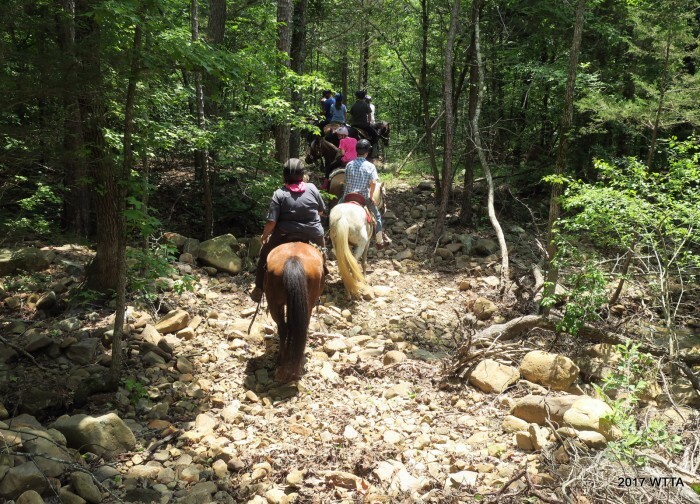 Trail Users: Equestrians, bicyclist, hikers, and motorized vehicles in some areas of the National Forest share the trails/roads. I did see signs on the CNT (Comanche Nation Trail) specifying ATVs allowed on one trail and ATVs not allowed on other trails. We also crossed paths with one ATV and one truck on the back roads of the forest. I saw several tire tracks on trails. We also saw what appeared to be bear tracks. Map: Elfie will provide a copy of a hand drawn map to each person. Elfie also went over the map with us, giving us good ideas of where to ride and the current conditions of the trails. On my last day at the park, Elfie helped me pick out a route that was fairly simple, since I’d be riding on my own, and she was available by phone for me to call if I had questions while out on the trail. 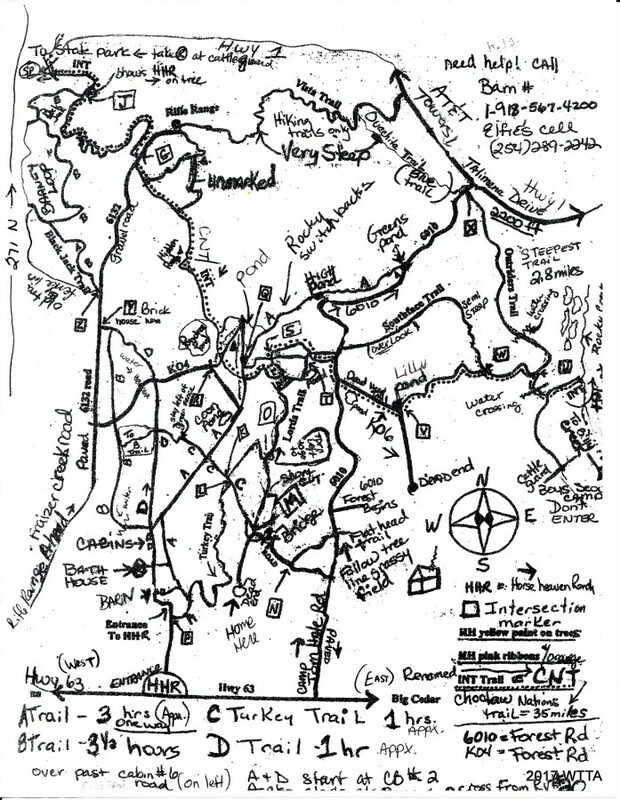 Since the map is hand drawn, it is a little hard to read and confusing. The map could stand to be updated but it is still useful. 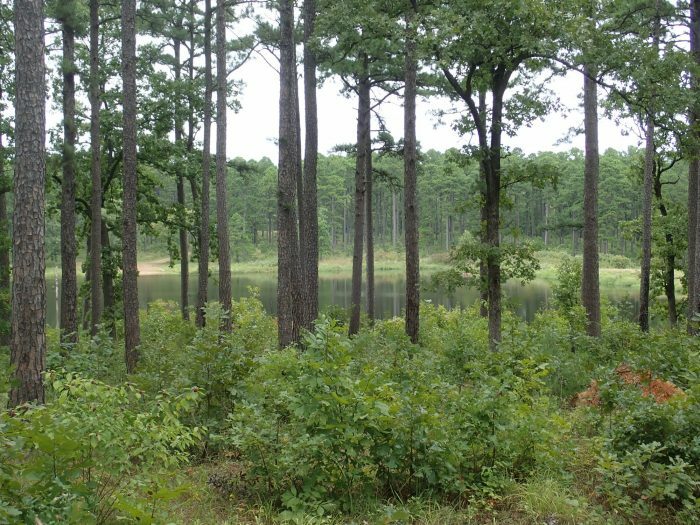 This part of the national forest is bordered to the west, north, and south by roads, and the east has several land marks such as houses and a boy scout camp; making it easier to navigate your way. 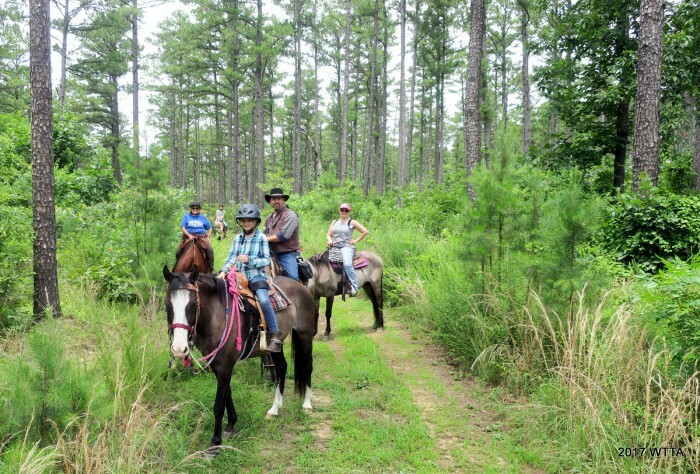 Mileage: The ranch advertises over 100 miles of trails which is highly likely since the ranch provides access to the Ouachita National Forest. There are several trails not listed on the map provided by Horse Heaven, which are not too far from the Horse Heaven Camp. 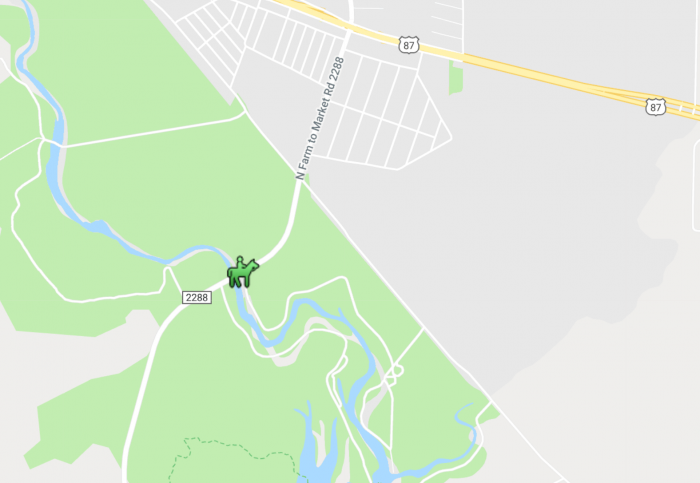 Only a section of the CNT (Comanche Nation Trail, formerly known as the INT, Indian Nation Trail) is shown on this map as it goes further east and west. 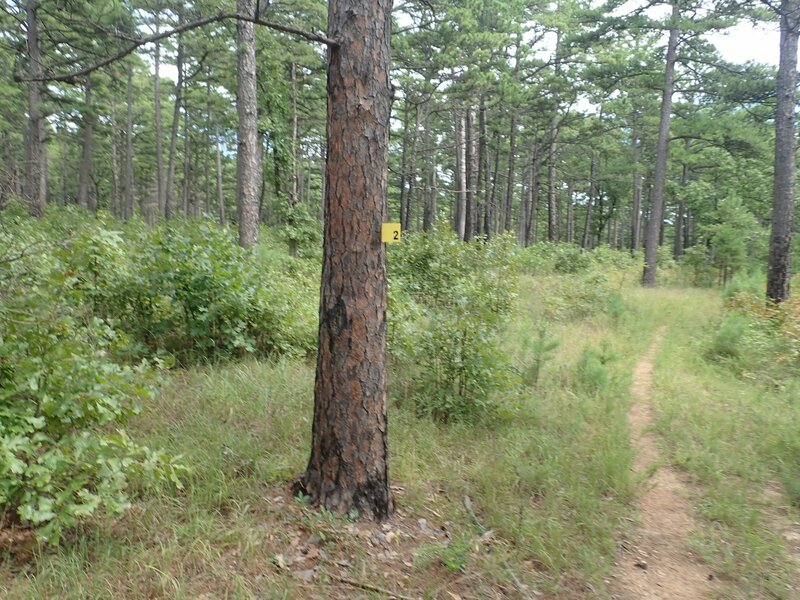 Trail Markers: The trails are marked by small yellow wood signs nailed to the trees, yellow paint on the trees, and also by pink and orange ribbons. It can be easy to miss the small wood signs on the trees if you don’t look close enough and there is not always a trail marking at all intersections. The map has letters in a box at intersections which correspond with letters at the intersections on the trail. The Forest Service has cleared paths with red signs and their own letters which are not on the map and this can get confusing. Elfie said that these forest service paths are mostly for forest work and fire breaks. 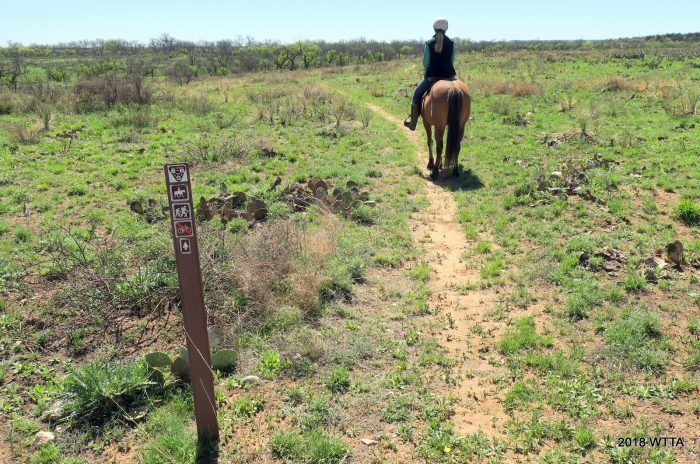 She said you can ride these paths if you want to, but they are not on the map and have nothing to do with the Horse Heaven Ranch. 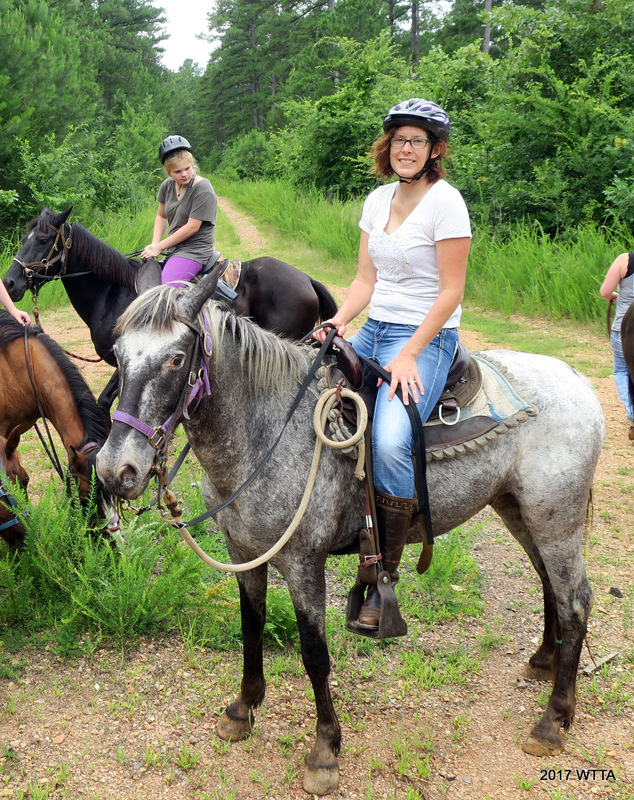 Terrain: The trails at Horse Heaven Ranch Resort are mostly rocky so please have shoes or boots on all four hooves. Some of the rocks have angled points, so if you are not using boots you might also consider pads with your shoes for protection of your horse’s hooves. 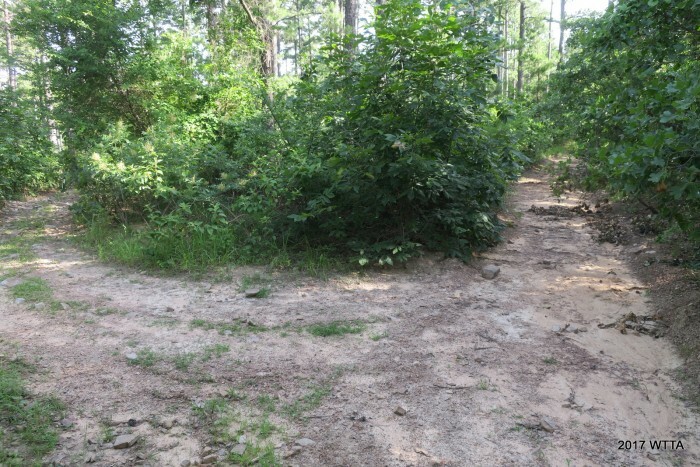 A few trails closer to the campsite are sandy with minimal rocks such as parts of A where it runs parallel with the barn and cabins, but you will still have quite a few areas on these trails that are rocky. The terrain is also flat to rolling, with some steeper grades. 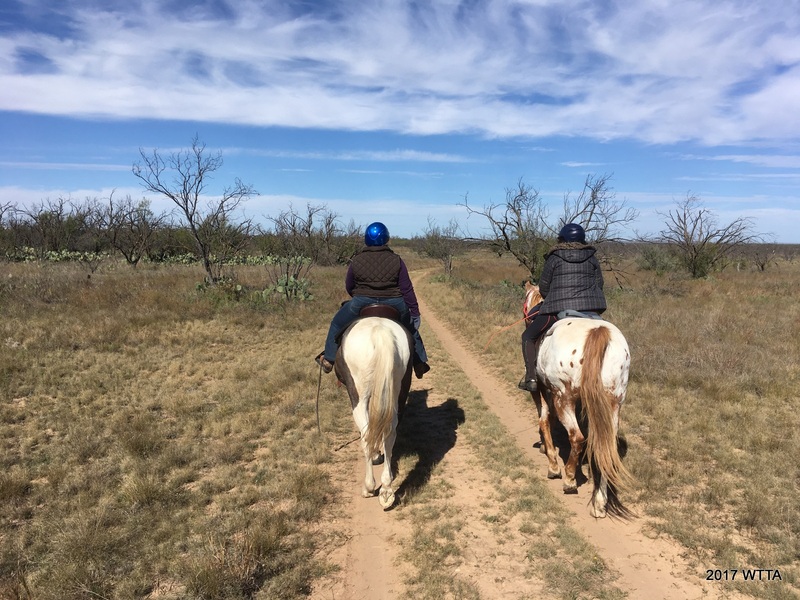 Elfie shared that the northeast side of the ranch, on Southface and Outriders trails have the steeper inclines and rockiest areas, but they also have the best views. 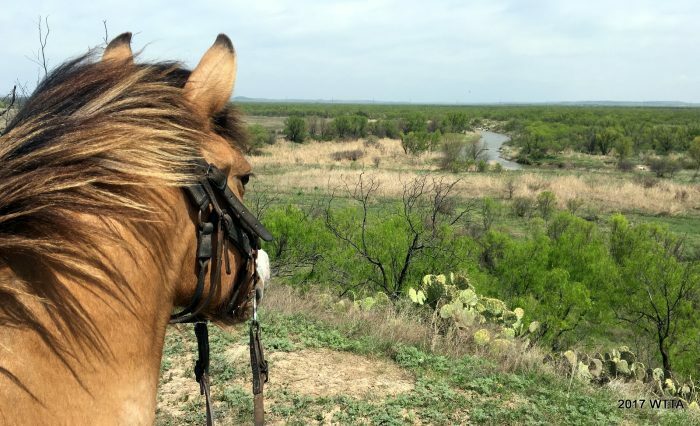 She said the best views are on the northeast side of the ranch. 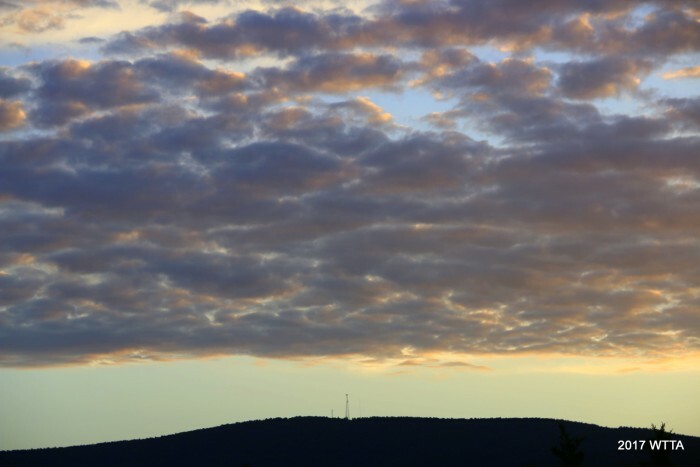 She said you can ride up towards Talimena Drive / HWY 1 near the AT&T towers for the best overlooks. 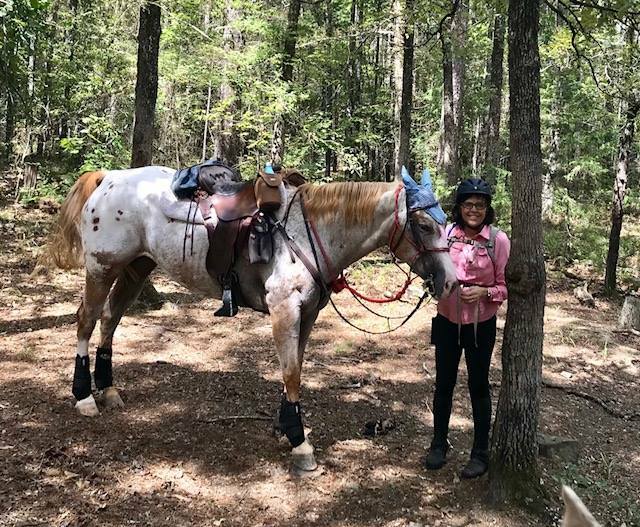 Elfie also shared that the Southface trail is really rocky now due to wash outs and on parts of it she recommends getting off and leading your horse. 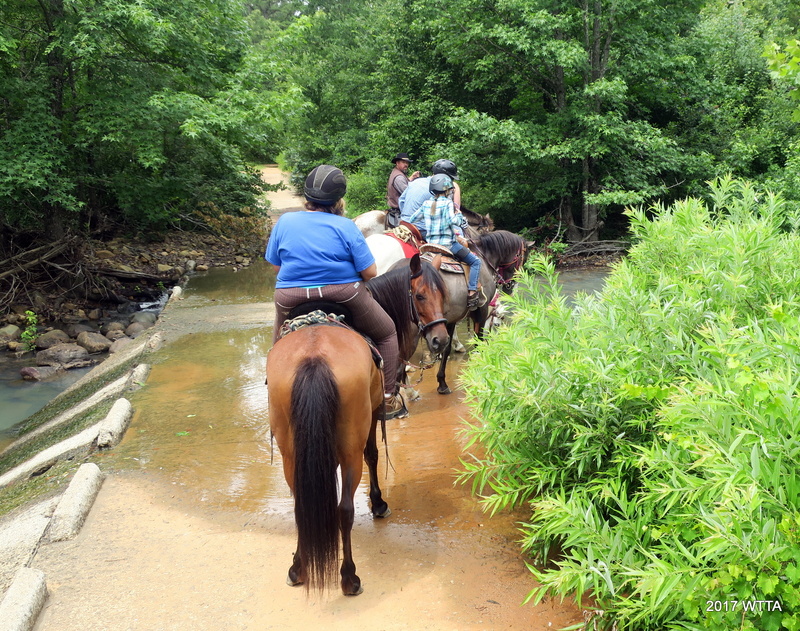 There were several creek crossings along the trail which still had water flowing through. 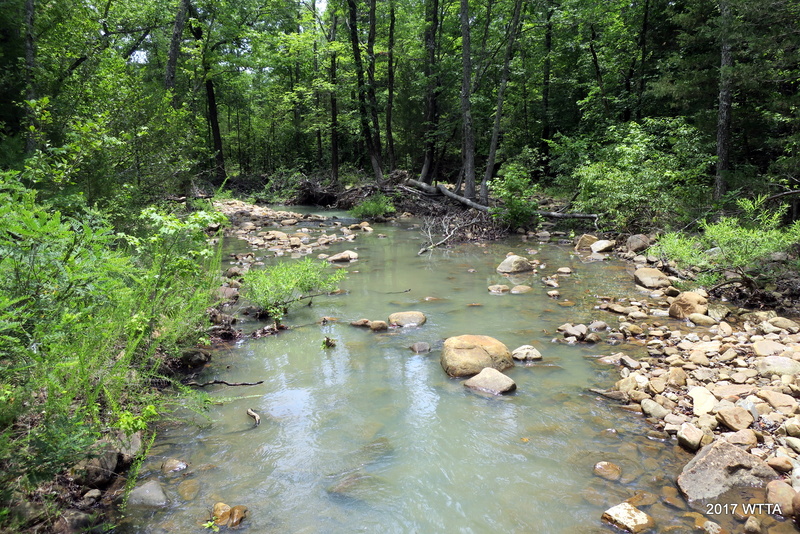 Most of the creek crossing have large rocks rounded and smoother from years of water flowing over them. 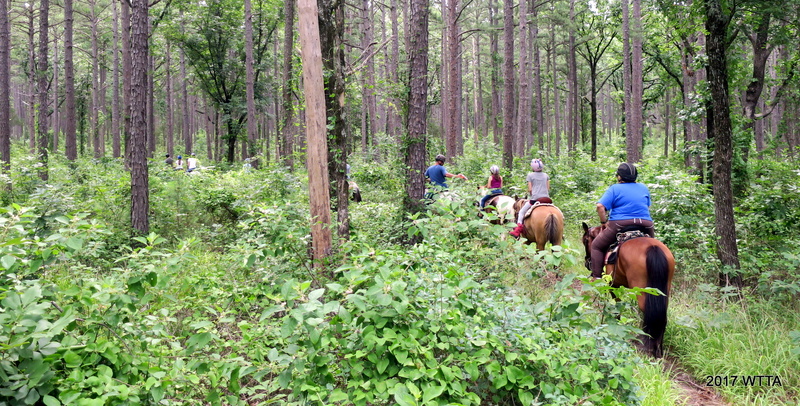 Almost all of the trails are heavily forested, full of vegetation providing lots of shade. Do watch out for the black berry bushes; they will reach out and grab you with their thorny vines. They particularly favored me for some reason. Difficulty: The trails we rode (A,B,C, D, Turkey, Black Jack, parts of CNT, and Flat Head Trails, KO4, Frazier Creek, and 6010 forest roads) during this visit were not difficult but they are mostly rocky. These trails are buried deep in the forest under towering trees and vegetation, which did not allow for open overlooks or mountain views. Elfie reports that the Southface and Outriders Trails are more difficult, rockier, have steeper grades, switch backs in some areas, but provide on the northeast side near by the AT&T towers some great overlooks. 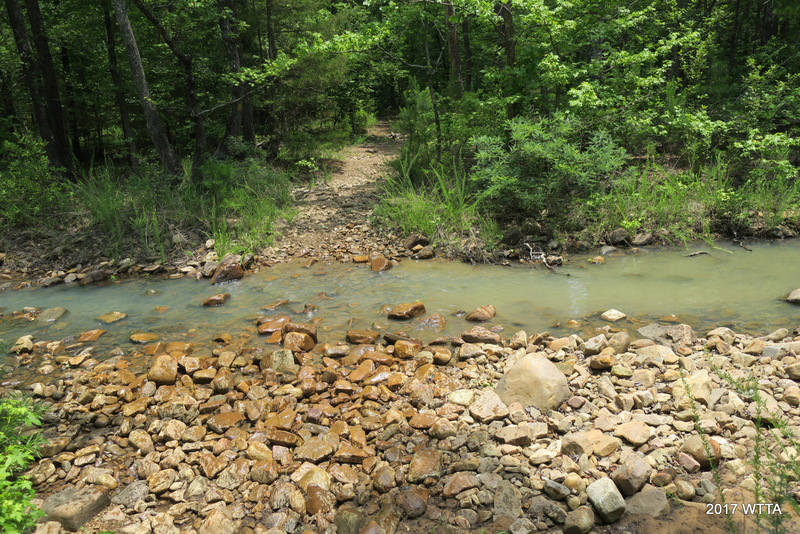 Water: This area of Oklahoma recently had rain resulting in several stream, puddle, and creek crossings. 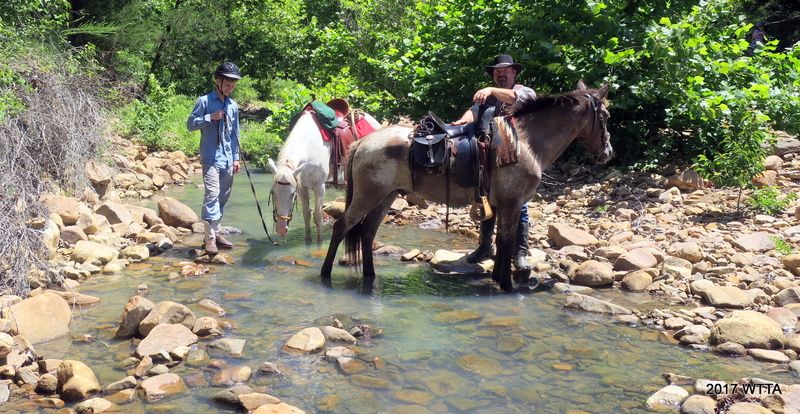 There was lots of water available to the horses on trail. Be aware there are no water troughs set out, the water sources are all natural. 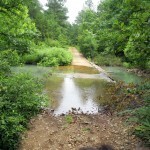 If it gets dry enough this will most likely limit water access on trail, especially during summer months. 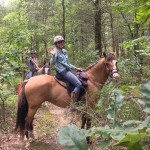 Trails: I really enjoyed the trails at Horse Heaven Ranch Resort. You will find yourself twisting and winding up and down through the thick cool forest. 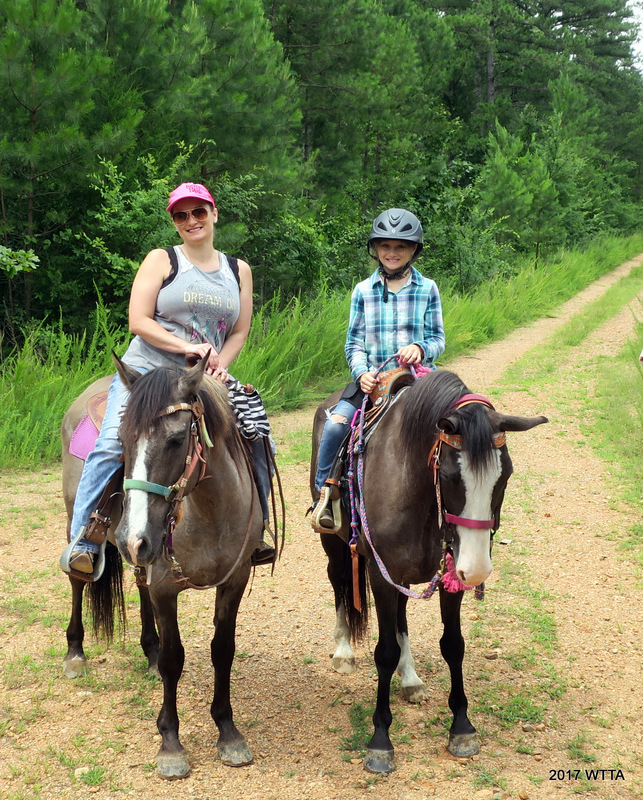 Our visit in June was a little warm so the shaded trails were a big plus. 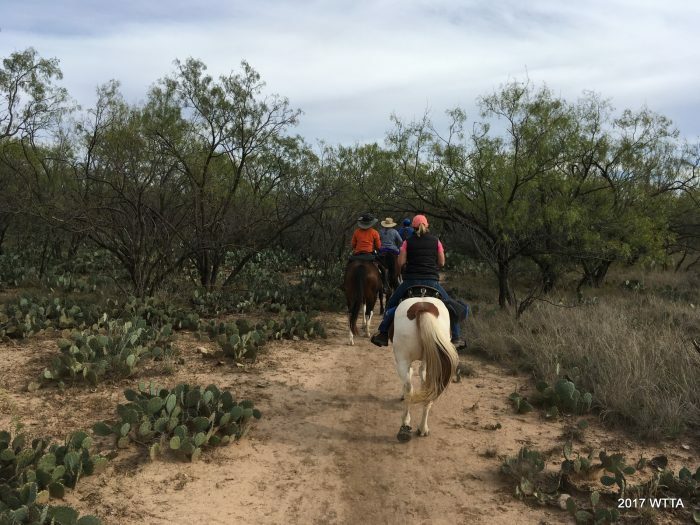 If you don’t want to venture off too far, many of the trails are close to the campground or if you are in an adventurous mood you can ride off the map. There is certainly not a lack of trails. Riding out on four separate occasions I was able to take a new path each time. 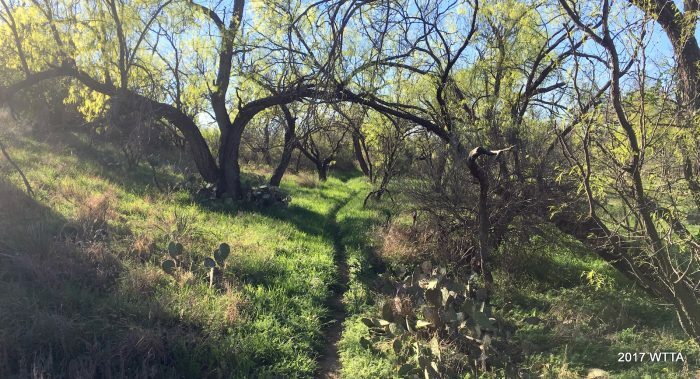 Along the trail we came across deer, armadillo, a beautiful and vocal red tailed hawk, lots of various birds, and lots and lots of large fat rabbits. Our trail boss also pointed out some bear tracks in the mud. 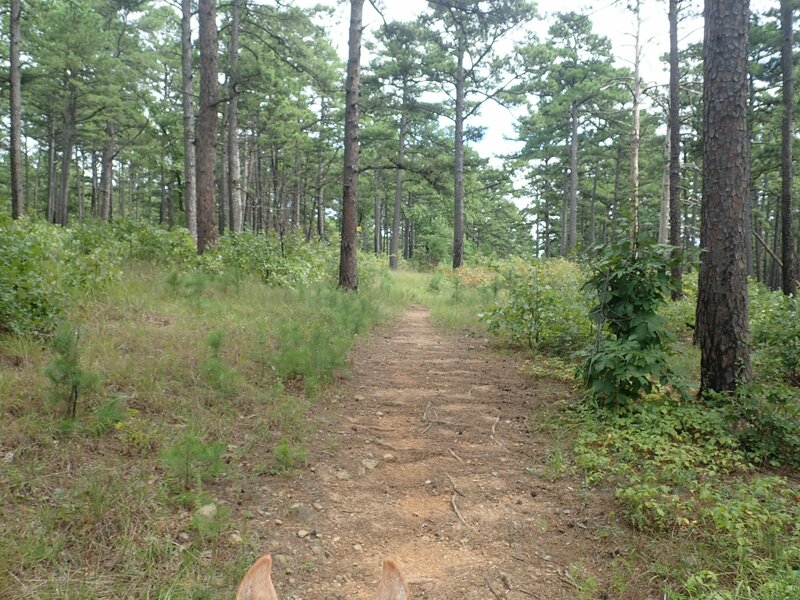 Elfie said they do have bears and cougars in the Ouachita Forest, luckily we did not see any. 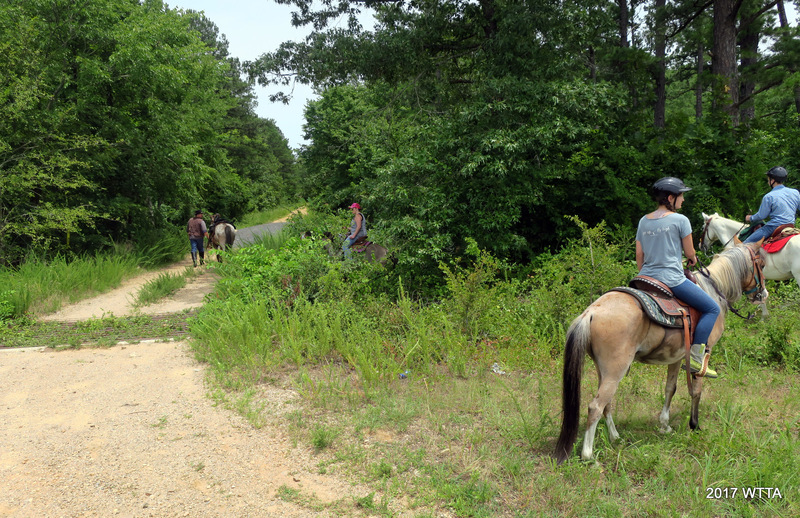 Between the sound of hooves and our group, I’m sure we scared off most of the local inhabitants before we could catch a glimpse of them. 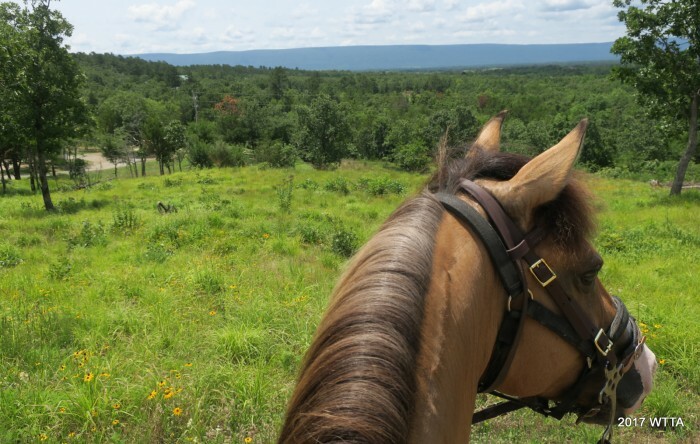 This is a place I’d return for future horse get aways. 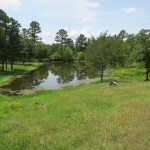 Fishing: Fish in one of the two ponds filled with bass, cat fish, and perch in the Horse Heaven camping grounds. Visit Talihina: Go out to eat and get one of the best steaks at The Rockhouse Steakhouse in Talihina. Visit this little town and pick up what ever supplies you might need; only seven miles from Horse Heaven. 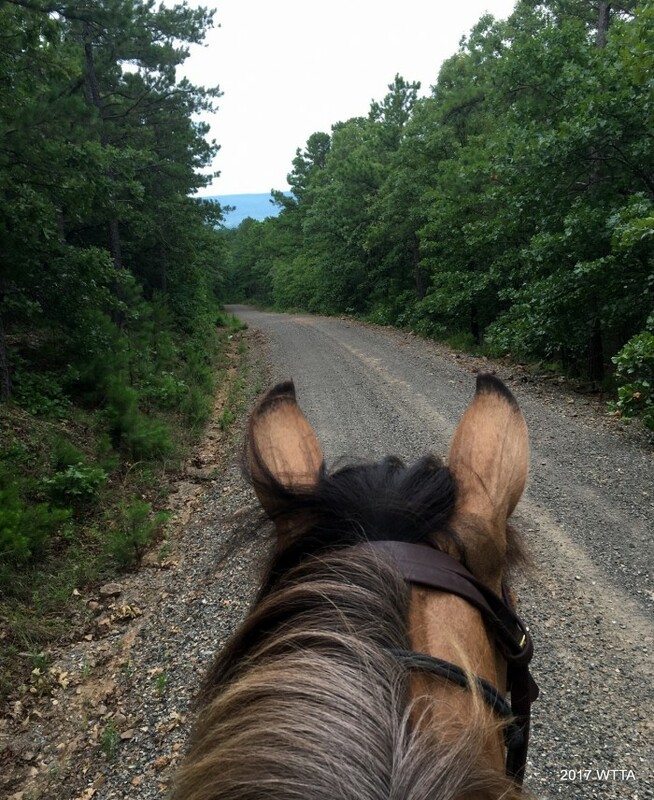 Trail Tale: How I needed a horsey vacation and going to the Horse Heaven Ranch Resort in the Ouachita National Forest was just the fix. 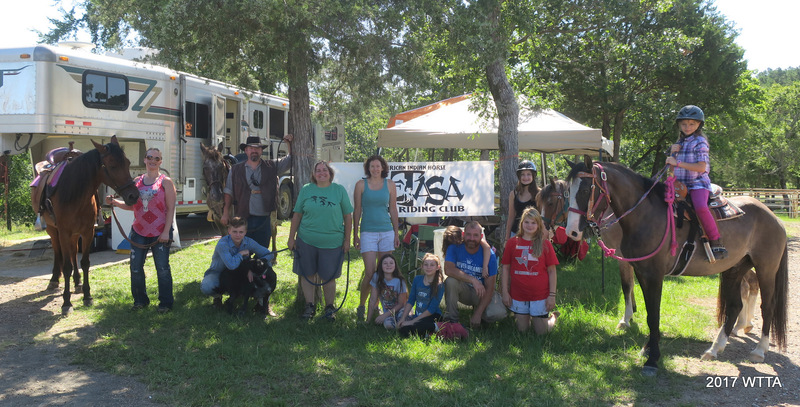 I was meeting up with NETASA, our Spanish Mustang/Indian Horse trail riding group. Upon inspection of our trailer it was clear we needed new trailer and truck brakes. That was expensive, but I’m thankful it was caught before we had a catastrophe. 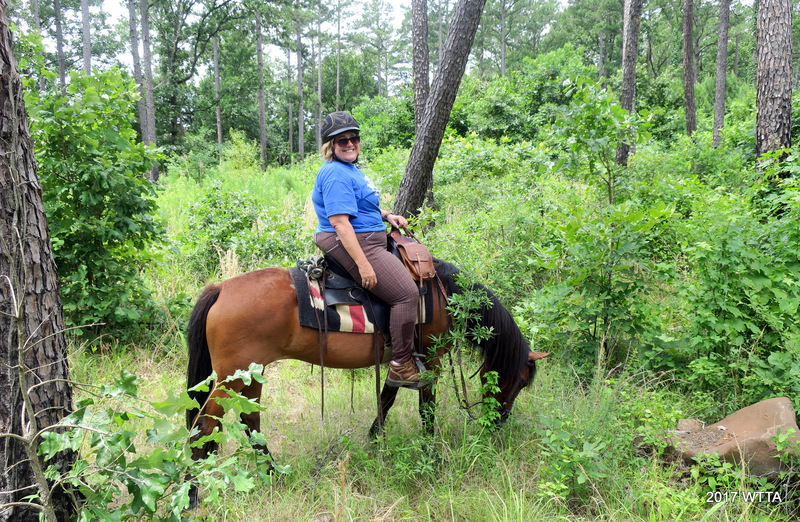 I could not catch a break, as now my husband Chris could not get off work, so I was going to have to haul my horse Angel up there 470 miles solo. Well not exactly completely alone, as I had my sweet dog LB along. Lastly, the weather forecast did not look promising with daily rain storms. I felt something was telling me not to go. But I really needed to get away and pushed myself forward with the plan. I was able to break up my travel into two days. I stayed overnight at my Mom’s and took her out for a birthday breakfast the following morning before heading off to Horse Heaven. Now that was good timing! Things were clearing up, as then I met up with the NETASA group in Paris. Unfortunately, Curtis and Patty had a flat on their truck, but between Curtis, David, and Chance, they quickly changed the spare out. Patty made for some good company as she rode the rest of the way with me. Thankfully, the remainder of the trip was mostly uneventful with one minor detour resulting in the sighting of a brilliant mountain rainbow, courtesy of Curtis. June 22nd 2017 we arrived at Horse Heaven, settled into our sites, and had a dinner of hot dogs. Another great thing about being with the NETASA group is that Curtis likes to cook, so I don’t have too! We all pitch in $$ for the food and enjoy. We had eggs, bacon, pancakes, sausage, and breakfast tacos; we had simple lunches, and had scrumptious dinners of pork chops, beans, corn on the cob, and fajitas with all the fixings. I greatly enjoyed the skits preformed and antics of David and Michelle’s and Andrea’s children. We had a blast playing Chicken Foot and Texas Hold’em in Andrea’s cabin. 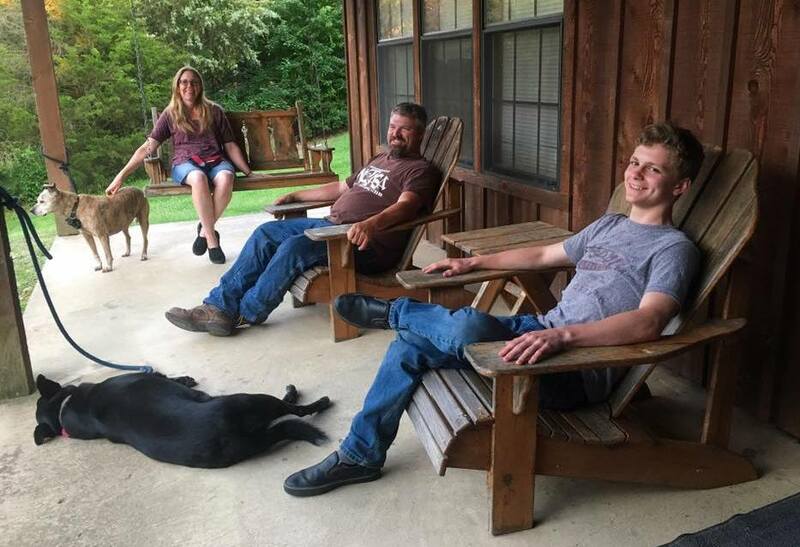 The cabin was perfect with a great view of the large pond in front and a quiet secluded back porch with a swing in back. The cabin, RV sites with electric and water, and the bathhouse with hot showers sure made it feel like I was not really camping at all. We were definitely not roughing it. 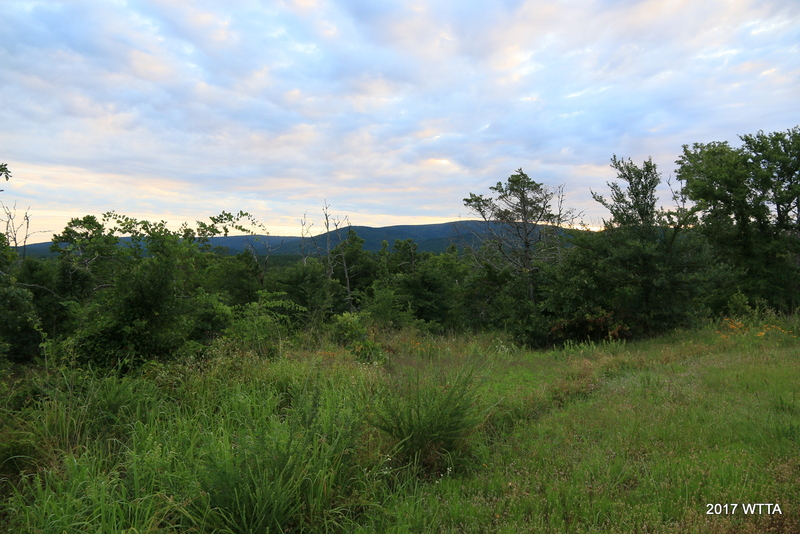 The camping sites (25, 26, and 27) made for great views of the mountains both to the north and south of us. 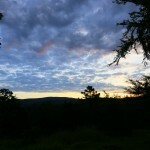 We gazed with delight at the sunsets, fire files, stars, and mountain sunrises. 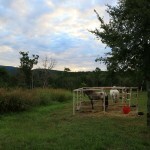 Overnight all I had to do was glance out my trailer window to see that Angel was just fine in her pen. Finally, I’m getting to the highlight of the trip, thirteen Spanish Colonial horses were making their way through the Ouachita National Forest, moving with swiftness and ease over the twisting rocky dense forest trails as if they were raised on them. Stepping over downed trees, carefully picking their way through the rocks, slurping up cool streams, grabbing mouthfuls here and there of sweet tall grass without slowing pace, and looking ever alert as they step forward with purpose and spirit. 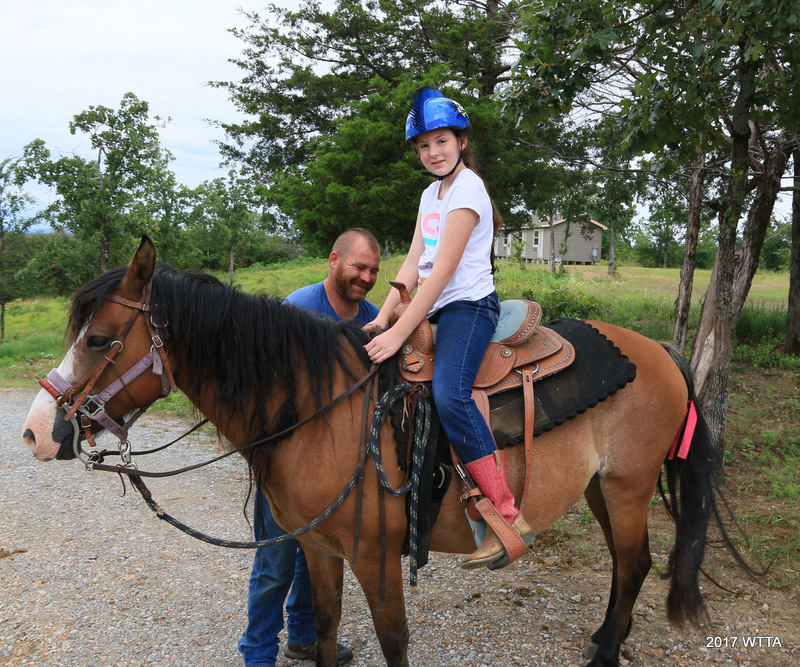 Our horses were in their element and loving it. This joy of being where one belongs was transferred from horse to rider; I felt in myself and observed it in my companions. Peace, relaxation, and the beauty of nature surrounded us all. 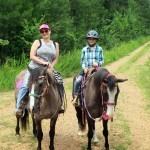 Our First ride out was terribly hot and humid and therefore short as well. 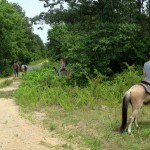 We rode a short loop on trails C and D located behind the cottages. The tree cover and creek flowing alongside us gave some relief. 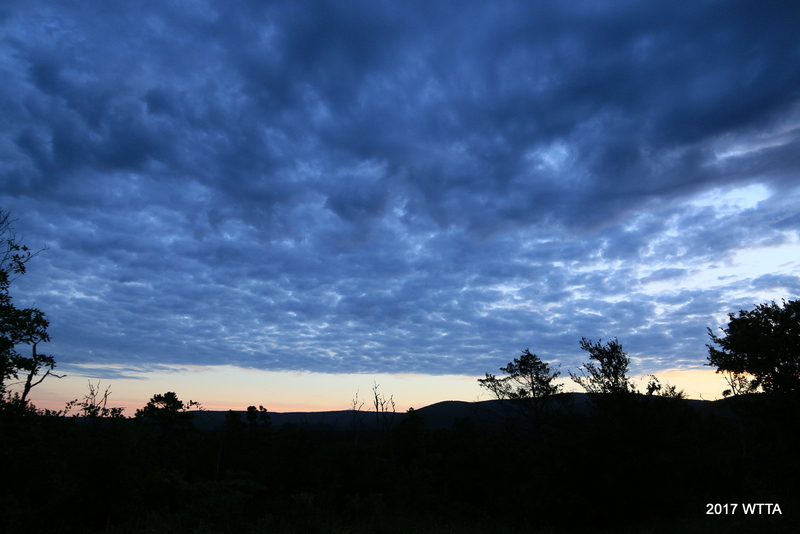 Moisture hung thick in the air; we were all ready for the rain to cool things down. It turned out the foretasted rain was a great blessing. That evening, we enjoyed rain showers from under a pop up canopy and watched a distant lightening show to the south of us. The humidity was finally gone and thankfully the showers blessed us with unusually cooler weather for late June in Oklahoma. 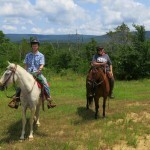 On our second ride we started out at intersection P which is just south of the barn and off of Horse Heaven Lane. There are a few large rocks on the east side of the road with a yellow wooden sign lettered P nailed to a tree above eye level to mark this point. From here we rode to Turkey Trail, to C, A, then K04 log road, to B I think, and then up north for a few strides along Fraizer Creek Road. Then we cut west taking the Black Jack trail loop around and then back to Fraizer Crk. Rd. From here we planned to go left at K04. We were blocked by a cattle guard at this intersection. Luckily Curtis scouted out a way around it, then back to camp we headed via trail B. This made for a great ride of just over 11 miles. Sunday morning was our last group ride and we were a little thinned out as David’s family had to head back early. 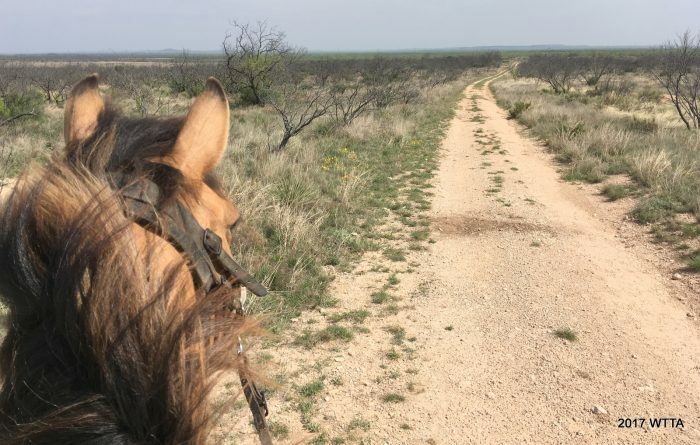 We enjoyed a leisurely five mile ride from trail A, to CNT, then along the KO4 and headed back to camp by way of the B or D trails which run parallel to each other. 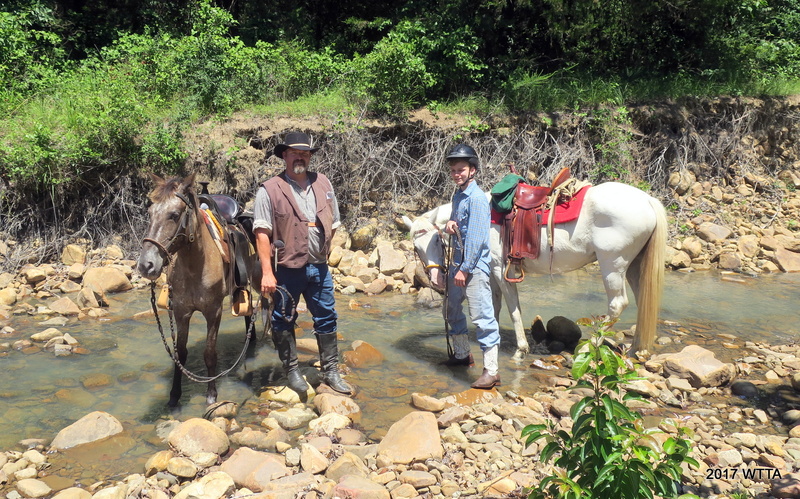 Stopping at a shallow flowing creek to cool off, we soaked our horses hooves, and enjoy ourselves. Of course we took lots of pictures too. I shared an apple with Angel. 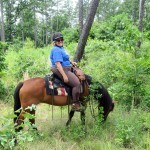 I love to pack trail treats that both I and my horse can enjoy. It was lovely not to be in a rush. Once back in camp we enjoyed lunch together and I said goodbye to our NETASA group. I still had one more night at Horse Heaven to enjoy before heading home. 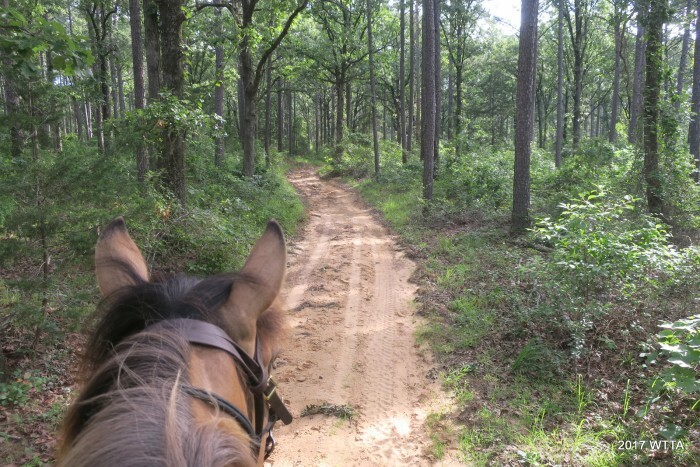 That evening I went out with Angel on an easy two and a half mile ride around the camp grounds and down one of the nearby forest service clearing paths. With the exception of two other RVs in camp we almost had the place to ourselves. I was looking forward to getting in one more ride before leaving tomorrow morning. A beautiful Monday morning at Horse Heaven. The best way to start the week! Angel and I are ready for the trail. 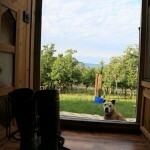 Monday morning, Elfie walked her dog over to my site and we settled up the bill. She recommended a route that would be about a two and a half hour ride, which was perfect. She was very helpful and went over the route with me. Elfie said I could call her if needed. Yes, there is fairly good cell service on the trails in this area. Angel and I headed north on A trail. I love that I can ride her with confidence in a group or independently, she is so versatile and the best horse I’ve ever partnered with. Since I was not in a group this time around I got to see little bit more of the wild life, no bears or cougars though thank goodness. Heading northeast on Trail A. 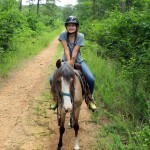 Starting out on trail A we (my horse, Angel, and I) crossed paths with an armadillo and a few deer. I was not fast enough with my camera to catch a shot of them. 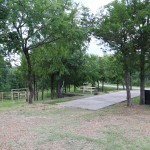 This is the CNT (Comanche Nation Trail) where we went right. I did not see any trail markers at this intersection. We cut east on the CNT trail which is fairly rocky and had a few creek crossing. 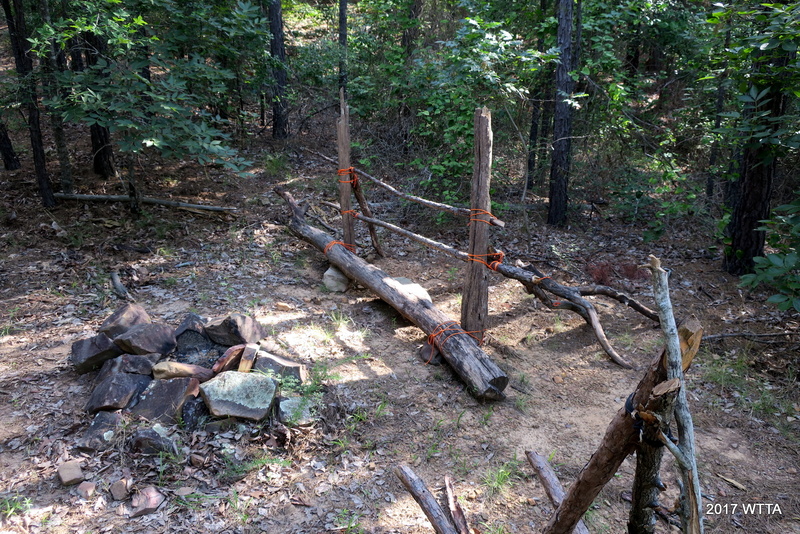 We came across a hitching post and wheel barrow structure put together with dead fall and orange bailing twine next to a rock fire pit. This must be a hikers tent camping spot. 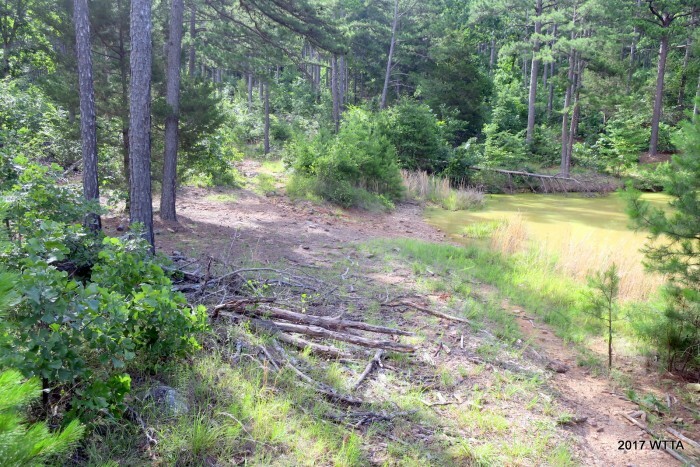 This looks like a camping spot along the CNT trail. 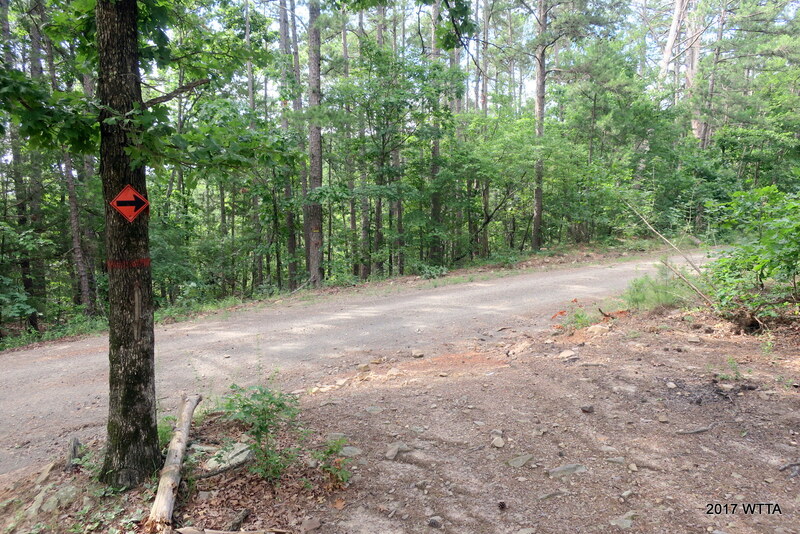 The CNT trail branched off into two trails, one with a ATV sign and the other with a no ATV sign. I did not realize I might run into an ATV on trail. I think these trails eventually came back together. From then on out I noticed lots of tire tracks along the trail. I later asked Elfie about this. She said it was unlikely I’d run into an ATV on trail on a Monday. She said the ATV’s are usually only on the CNT and logging roads. ATV trail along the rocky CNT, the ATV sign is upside down. ATV restricted section of the CNT trail. Along the CNT, we passed a copper colored pond. Here, there was also a forest service path to the left which we passed by. Passing a pond to our right along the CNT. 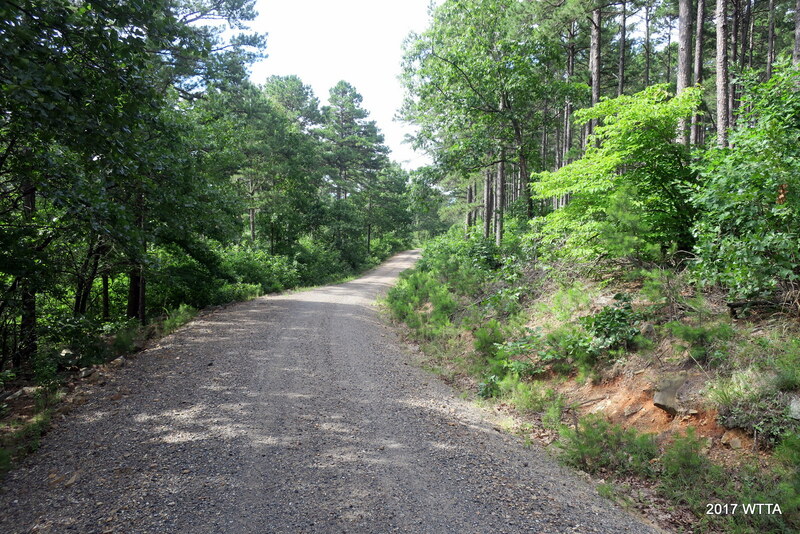 We continued on CNT and then came to the 6010 gravel road. A red sign pointed us to the right/south. Coming to 6010 road from the CNT trail, we are directed to head south. Angel and I went along this road for a few miles before our next junction. On this road, there was no traffic and we did not see another soul. From here we had a few glimpses of a mountain range to our south. From 6010 heading south, Angel and I are looking at the mountain range ahead. Just as Elfie and the map points out I came to a house. 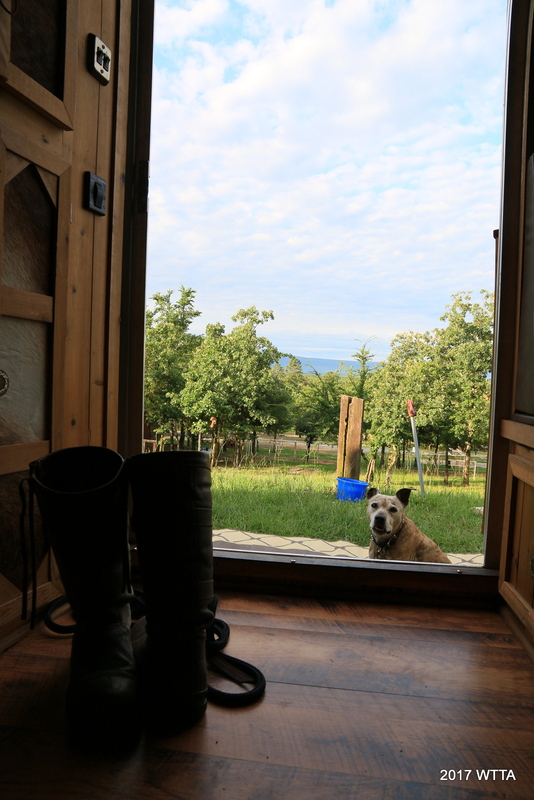 Angel was happy to greet three horses pastured next to this home. Three friendly horses are nickering greetings to Angel. Here there is an open field to the right. 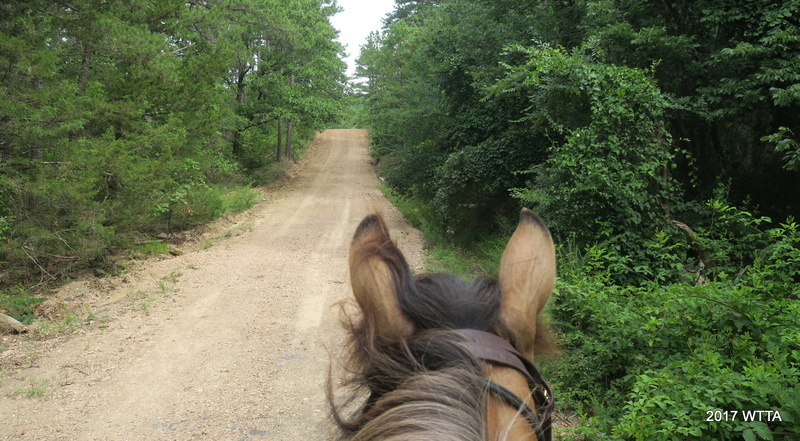 I rode down the right side of the field and kept the trees to my right, as the map and Elfie instructed. From road 6010 at the house, turn right into this field, keeping the treeline to your right to pick up Flat Head Trail. Look for the pink ribbons on your right to pick up the trail. 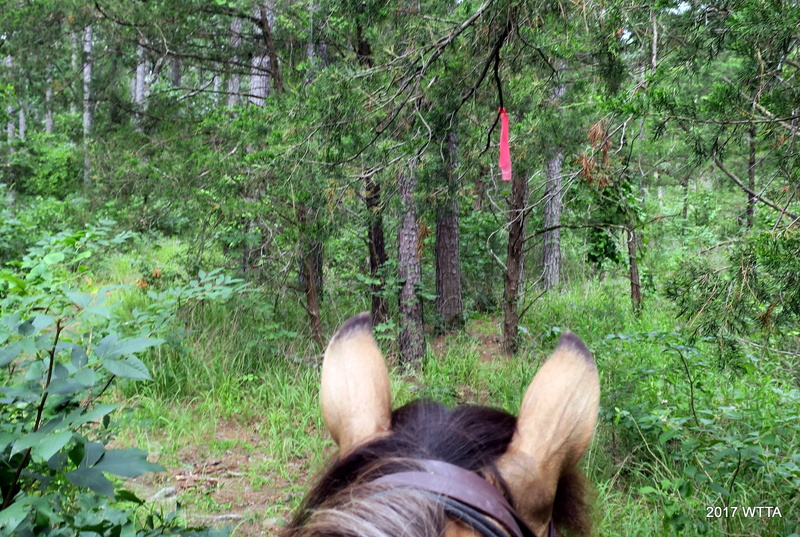 I soon saw the pink ribbons, we picked up flat head trail heading southeast. 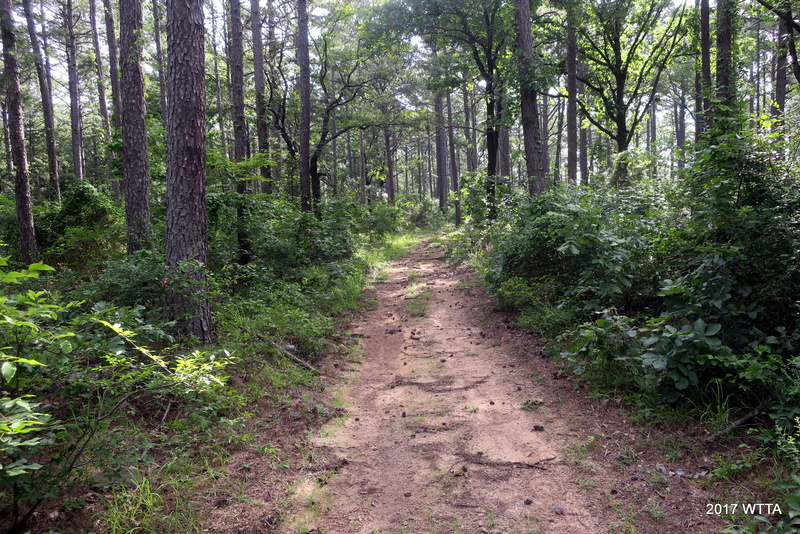 I enjoyed this short trail through the woods and it was well marked with several ribbons. Flathead trail is well marked with pinkish ribbons. Flat Head eventually opened up to another road. I did not see a name for this road on the map or on the actual road. Heading northwest on an unnamed road between Flat Head and C trails. Turning right at this nameless road eventually took us over a small wooden bridge. Little wooden bridge along the nameless road. I continued to followed the road a little ways, then turned right off the road onto a trail before hitting the intersection labeled M on the map. Here I got a little confused and thought I was taking the Lord’s Trail by going right but soon saw the yellow wooden sign nailed to a tree with the letter C. This worked too and just made my route slightly shorter than anticipated. I’m not sure how I got off my planned route but the good news was, I was not lost. Intersection M, marked on the map with the letter M in a box and here on trail marked by a yellow sign nailed on the tree. This trail seemed to follow a forest service path as well. I took a right here thinking I’d be going on the Lord’s Trail but ended up on C trail. Trail C, somewhere between the nameless road and Turkey Trail. From trail C, I went left to Turkey trail, and then on A to head back to camp. Heading north on Trail A between Turkey Trail and the campsite. We are almost back to our campsite. 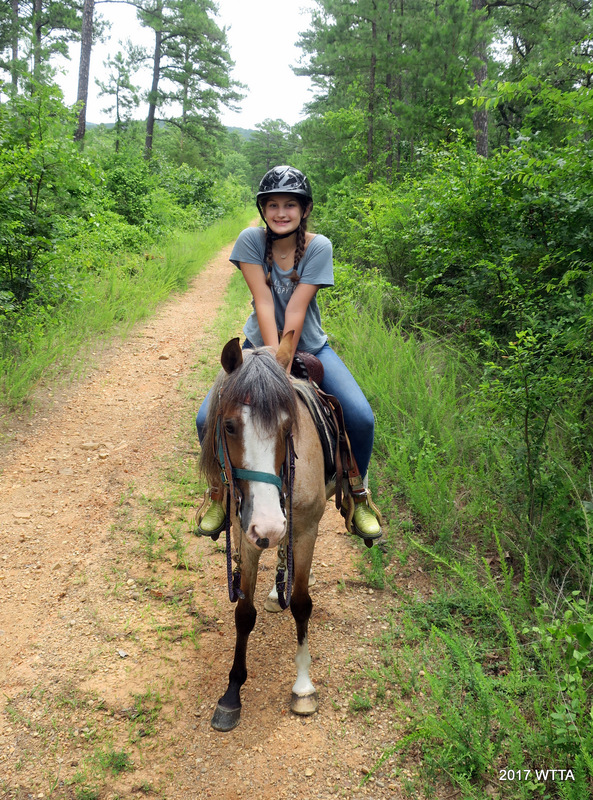 Angel and I had a great ride. My Angel, as usual, was steady and dependable. Back at Horse Heaven Campsite after a great ride. 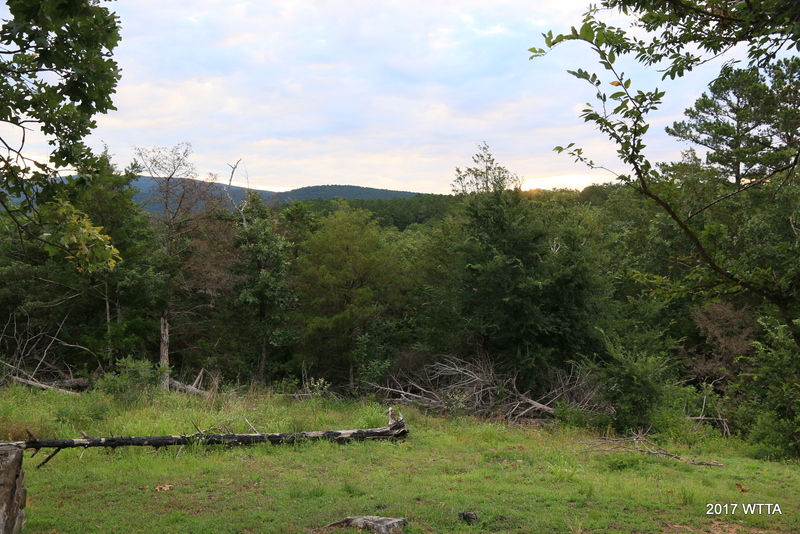 Taking one last look around at the beautiful campground views before getting ready to head home. I thanked Angel for being so awesome. 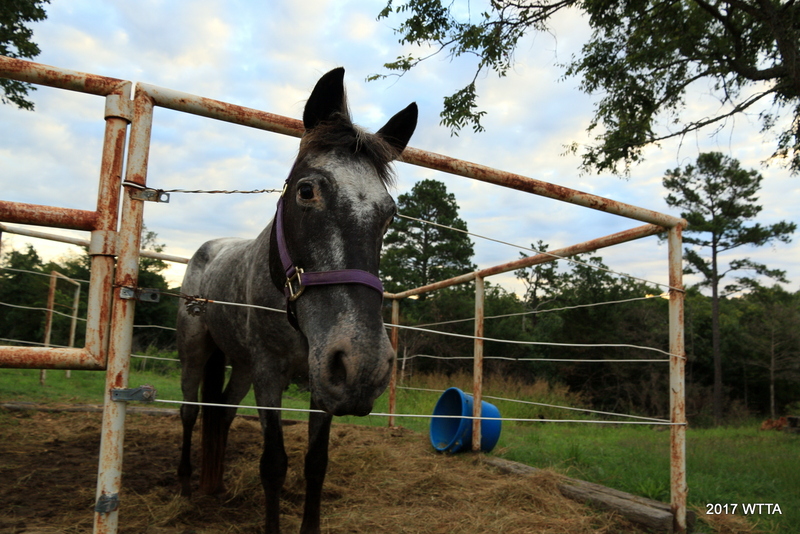 I hosed her off then gave her some hay to enjoy while she rested and I packed up camp. We said goodbye to Horse Heaven and headed home. This time I was the one to get a flat tire on HWY 2 just four miles north of Antlers. I had to get off the two lane highway, as I was on a curve and it was a dangerous spot. The grassy side of the road was at an awkward incline which caused other problems. When I weighted my options, I’d rather be in an awkward position than get hit on the side of the road. Just keeping the door open at that angle was a challenge. I got out the spare tire key and jack handle and started putting them together to get the spare out from under the tuck. However, with the trailer attached and being at such an incline things were difficult. 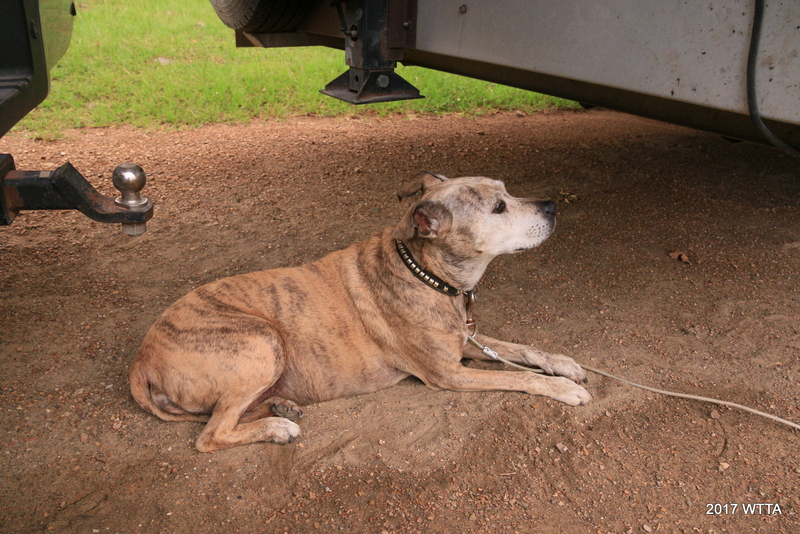 I also was not sure our jack could handle the weight of our truck with the trailer in tow. Then I thought to myself, why am I doing this. Honestly I was not so sure I knew what I was doing. People kept coming by that I did not know wanting to help. Everyone seemed friendly enough, but I just told them I had someone coming. I decided to call a tire shop in Antlers. 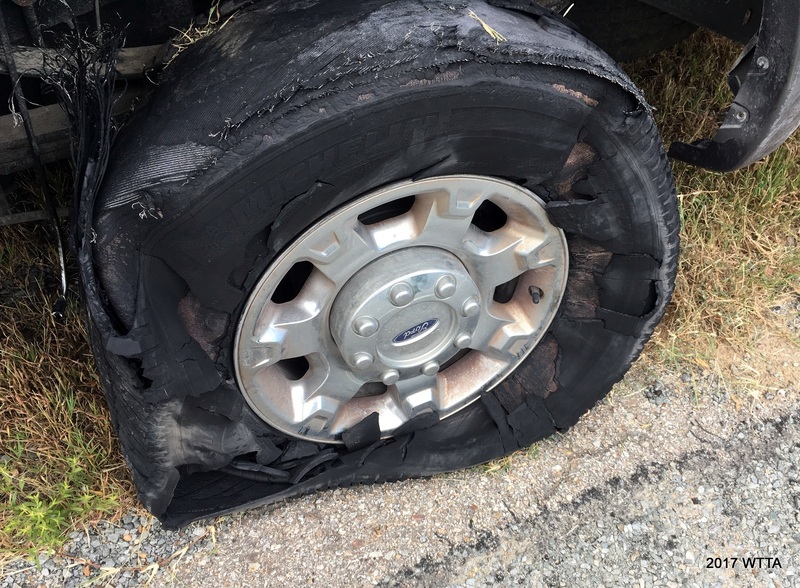 Isaac with Kiamichi Tire Service was by in no time. 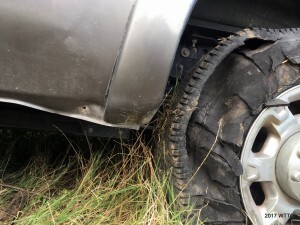 However, he also could not change the tire due to the incline the truck and trailer were at. I had to put it in four wheel drive low and drive up a hill and over to the right further away from the road to get on level ground. It was slow going as the rim was digging into the ground while the truck labored along. Once in a better position Isaac got the spare out and tire changed. Getting back up to the highway was another ordeal. 4×4 low was a no go. Isaac suggested I try 4×4 high and go straight up and out instead of gradually going up at an angel. It took some effort but this plan worked. 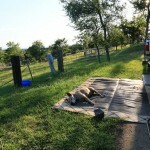 Problem was, once the truck got up on the road the angle of the truck bed and trailer nose was too much and the bed of the truck hit the trailer nose causing some minor damage to the truck bed, damn! 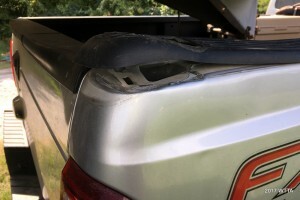 Damage to the truck bed. This is what Angel thought of the trip home. I then followed Isaac into town to pay my bill and get all my tires checked. Thankfully the rest of the tires were fine. 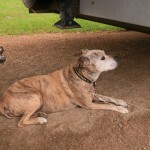 Angel had enough and was stomping impatiently in the trailer. 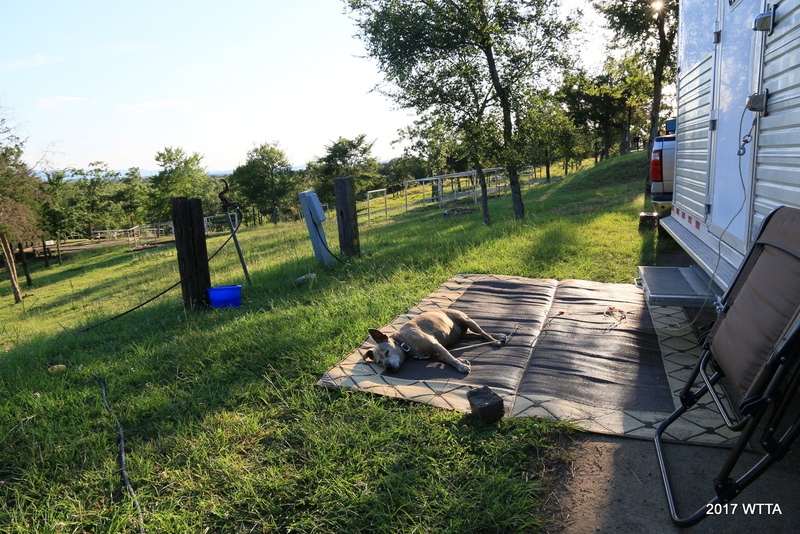 I found a nice grassy area to take her out of the trailer to give her a rest and make sure she was ok. Angel enjoyed grazing for about an hour. She also had a nice roll in the grass, some hay, and drank a good amount of water before we headed back to my mom’s. She was just fine. We were a bit off schedule now and I decided to take the back way staying away from Dallas, so we finally got to my mom’s around 12:30am. 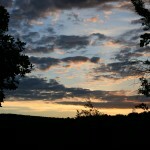 I had a good long visit the following day with family and headed home once it started to cool off some time around 7pm. If anything were to go wrong again, I did not want to be on the side of the road midday in June in Texas. Luckily, there were no more hiccups and we made it home just fine. I learned that I need to practice changing truck and/or trailer tires while the trailer is attached. I also learned, if I’m going on a long trip I’m going to have an extra spare within easy access in the bed of the truck. Lastly, don’t worry about ruining the wheel rim, if you are in a bad spot just keep driving slowly on the road with hazards on until you can get to a better area. 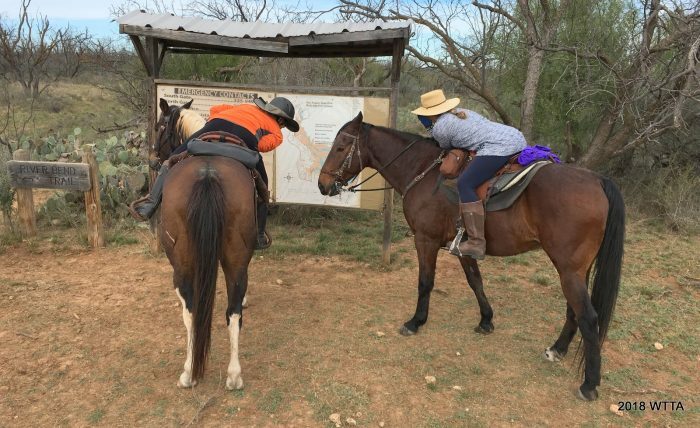 Looking forward to my next camping trip but hoping next time I’ll have someone along for ride, as a horse and dog can’t really help much with changing a tire.